After our successful Leaf Hunt on Sunday, and outdoor Leaf Art on Monday, we were feeling inspired and in the mood for a bit more Autumn Art on Tuesday morning. Monkey was unwell, but the other three drew pictures of their Autumn treasures, and then we did some leaf rubbings. I say “we” because I did it as well – and it was very satisfying and therapeutic! 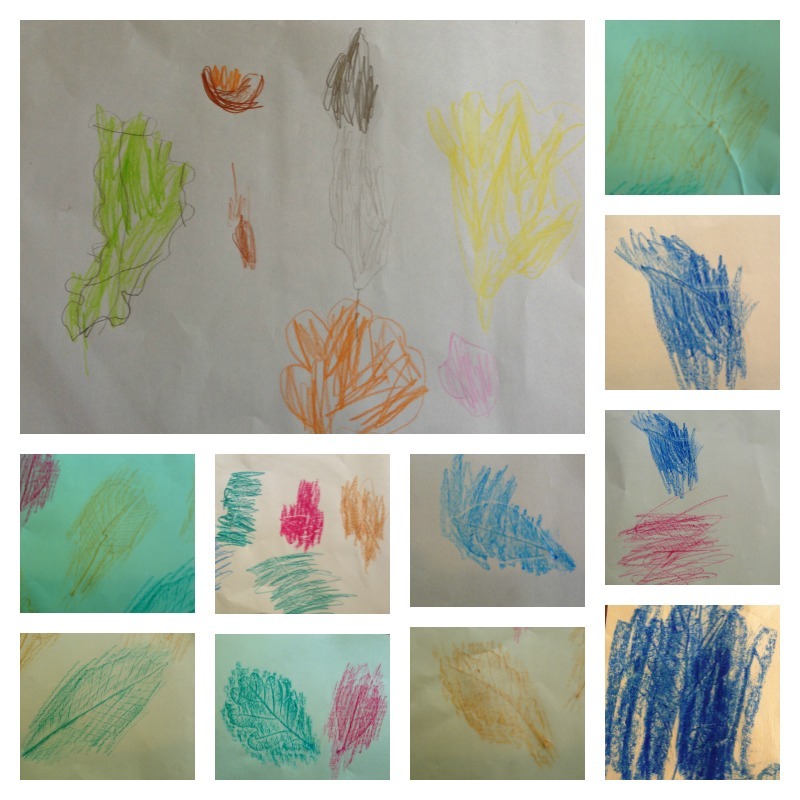 The yellow, green and blue leaves in the picture above were drawn by Tiddler. 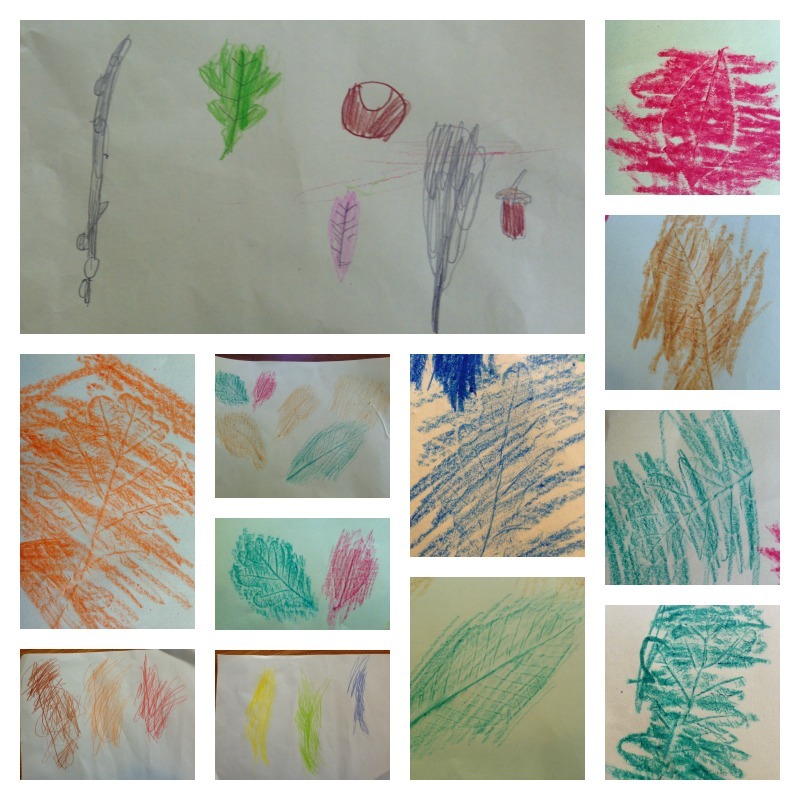 In the photo collage, they rather blend in with the leaf rubbings, but I was very proud of his observational drawing skills – well, they are a good leaf shape, even if the colour is not so accurate – we did not discover any rare blue leaves! 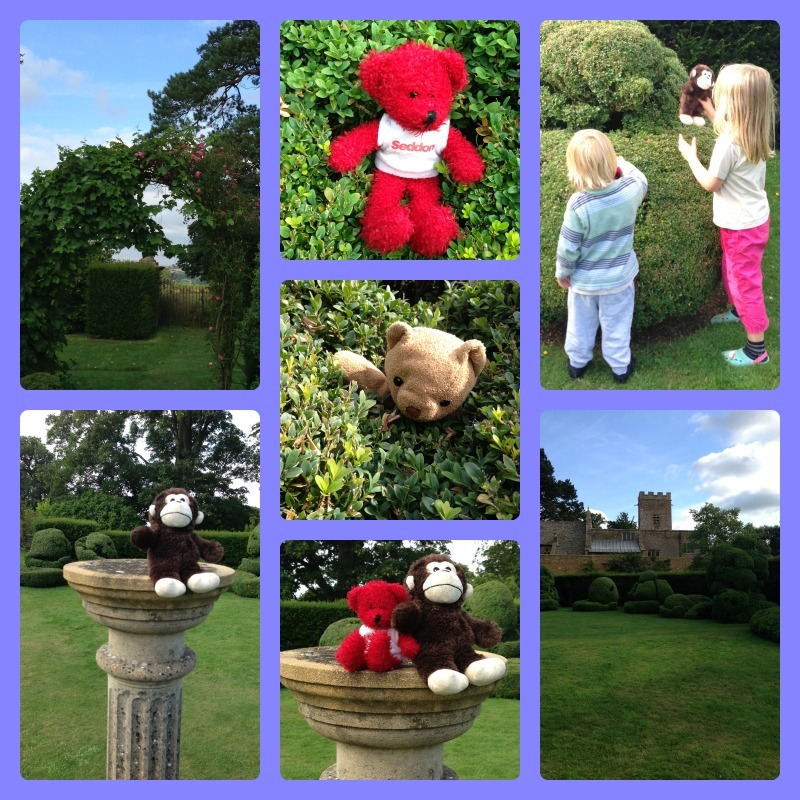 On Tuesday afternoon, we wanted to take the three children who were well enough out for some fresh air, but Monkey needed to stay inside and rest as he was very poorly. 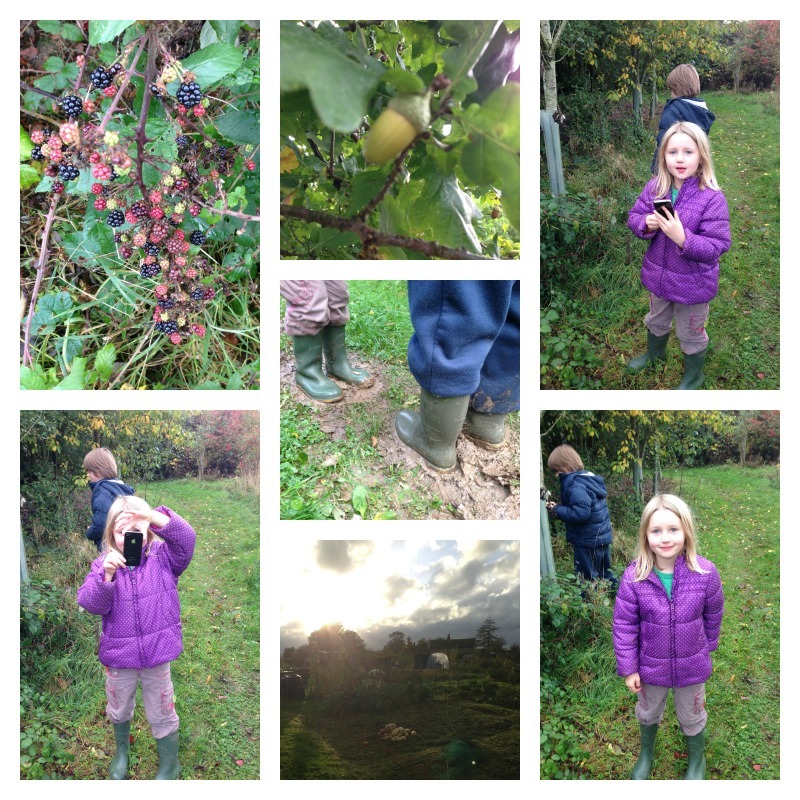 So first of all, Tiddler and Rabbit went with Granny to pick some apples in her friend’s garden. Later on, I asked Owl to come and pick some berries with me in the woods, and Rabbit decided to come too. We set off through the village, and as I turned to take a photograph of Rabbit I noticed that Owl had brought one of Daddy’s old phones with him so that he could take some pictures of his own. Rabbit, therefore, featured in quite a few photos, but I don’t think she minded the attention! We walked up to the green, and then across to the woods, past the allotments where we admired someone’s amazing pumpkin and squash harvest. 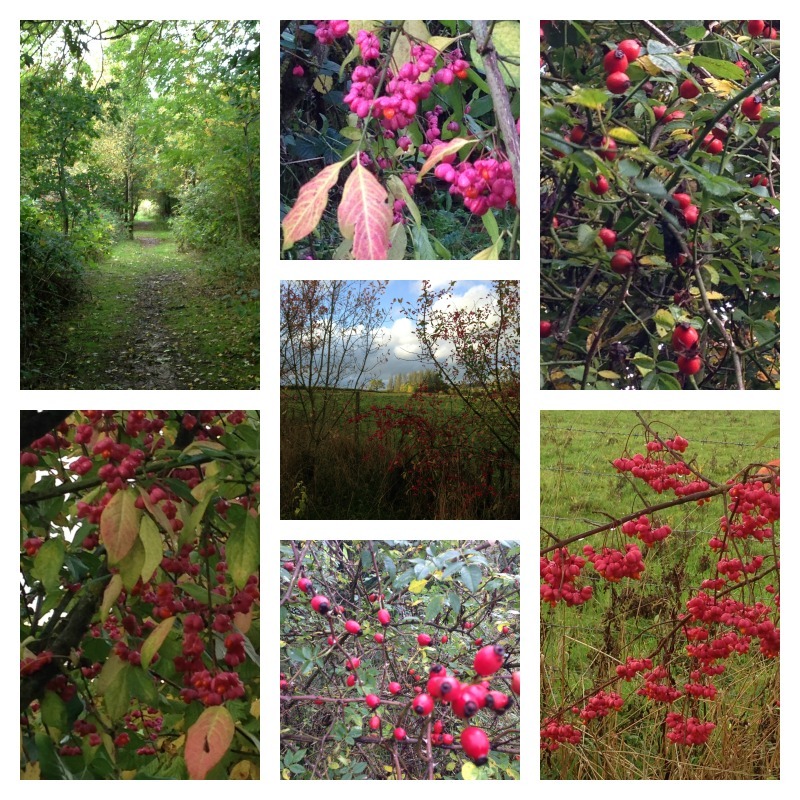 We had a lovely walk, and managed to pick plenty of berries. 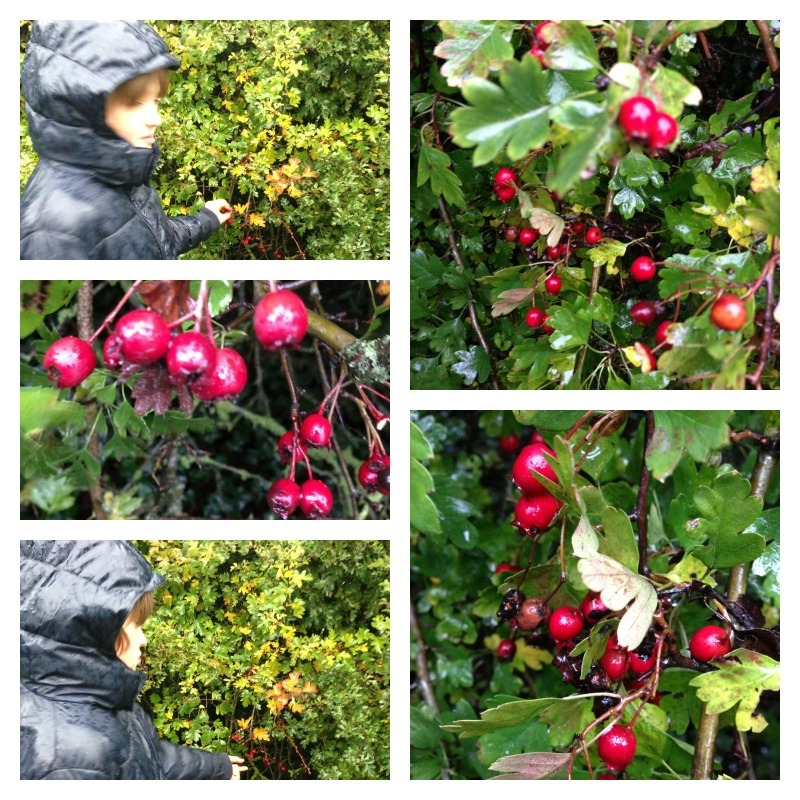 There were a lot of rosehips, and we were surprised (and pleased) to find a reasonable number of brambles too. After being out for quite a while, we reluctantly turned back as the afternoon was almost over. It was beautiful and peaceful, and we could have stayed longer, but it was nearly supper time. The children enjoyed squelching in the mud with their wellies, so we paused for a little while in a particularly good muddy patch. Rabbit took a turn with the phone camera, and thought it was very funny to take a picture of me taking a picture of her. As we left the woods, we picked some haw berries and a few more brambles at the roadside, and then went back across the green. After a very quick play on the roundabout, we walked back to Granny’s house, stopping to pick some elderberries on the way. We arrived back in time for supper, and had stewed apple and bramble for pudding. 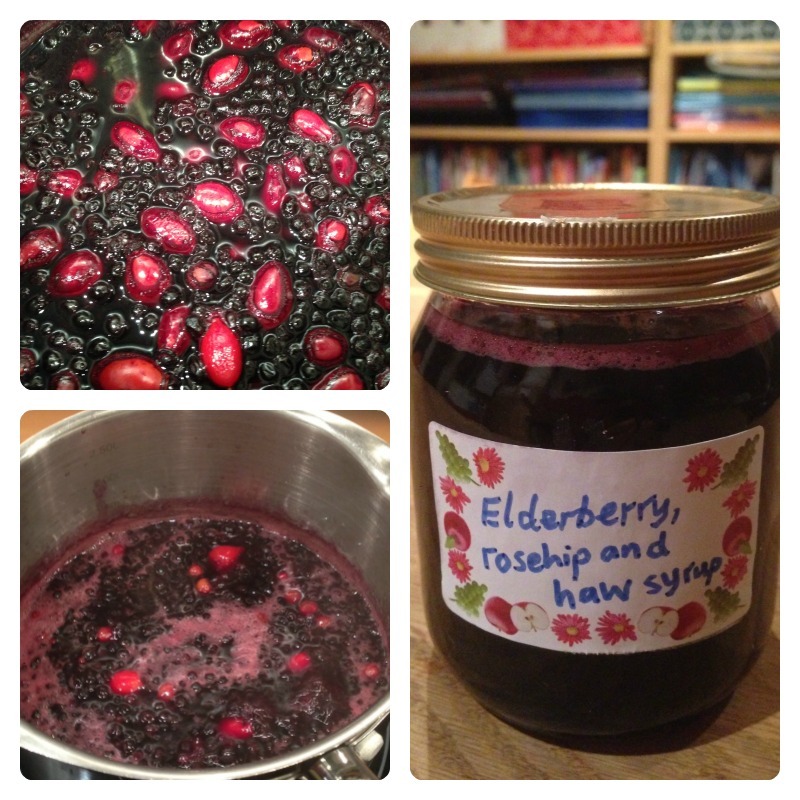 I brought the rest of the berries home with me, and made another batch of elderberry, rosehip and haw berry syrup. It was a lovely walk on a beautiful Autumn day, and it’s nice to have something to show for it too. 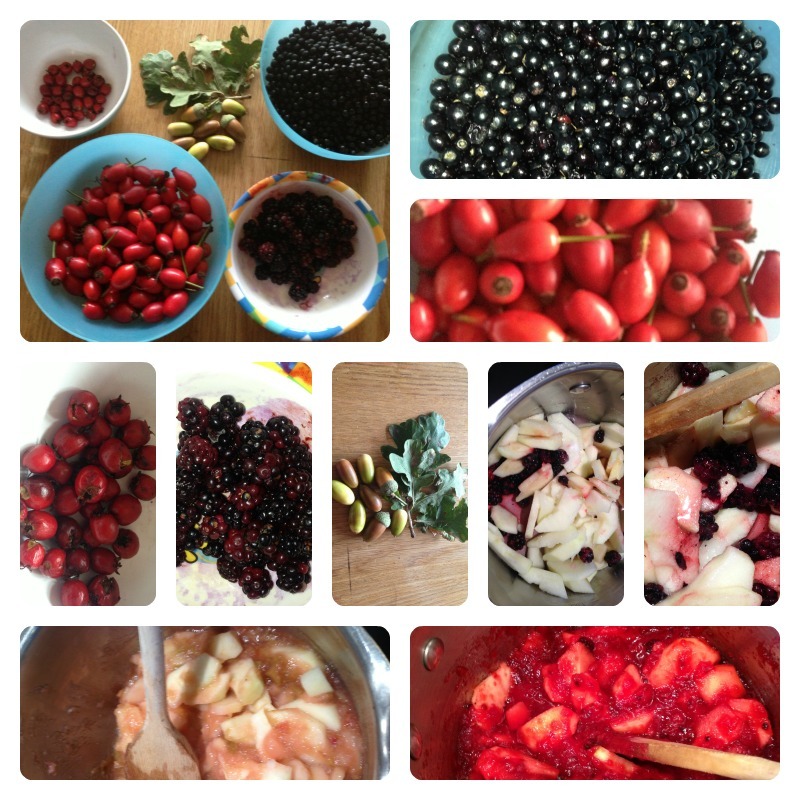 This entry was posted in Natural Childhood and tagged Autumn, brambles, elderberries, foraging, haw berries, rosehips on October 27, 2013 by Hannah. We have been staying at my mum’s house for a few days, and I was looking forward to the opportunity to go out for a walk or two, so on Sunday afternoon we went up to the village green, ignoring the prospect of rain. 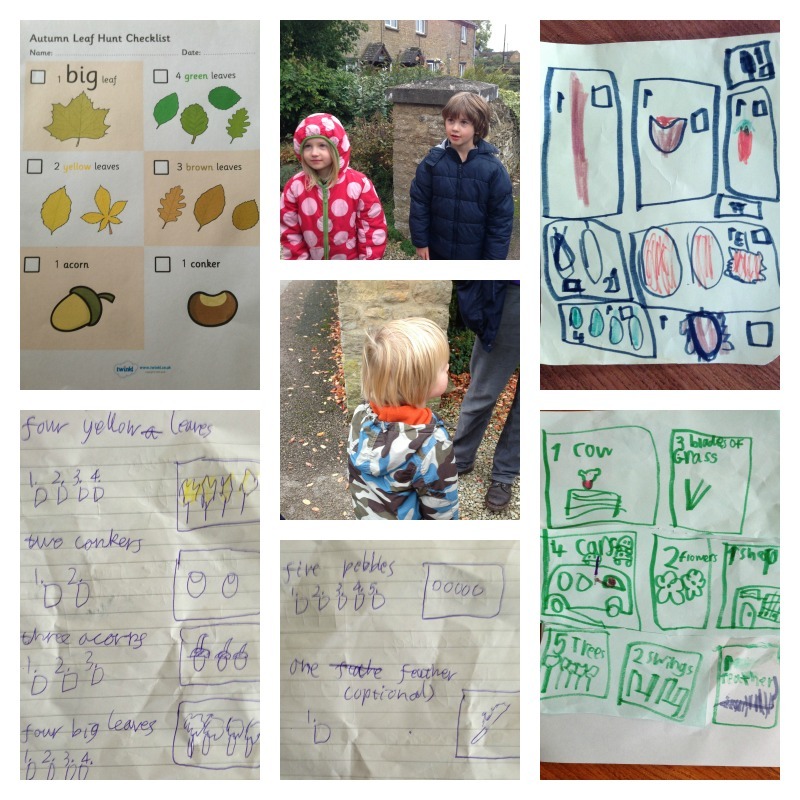 We took our Autumn Leaf Hunt Checklists with us. The printed list was perfect for Tiddler, but a bit easy for the others so they made their own additional lists before we set off. 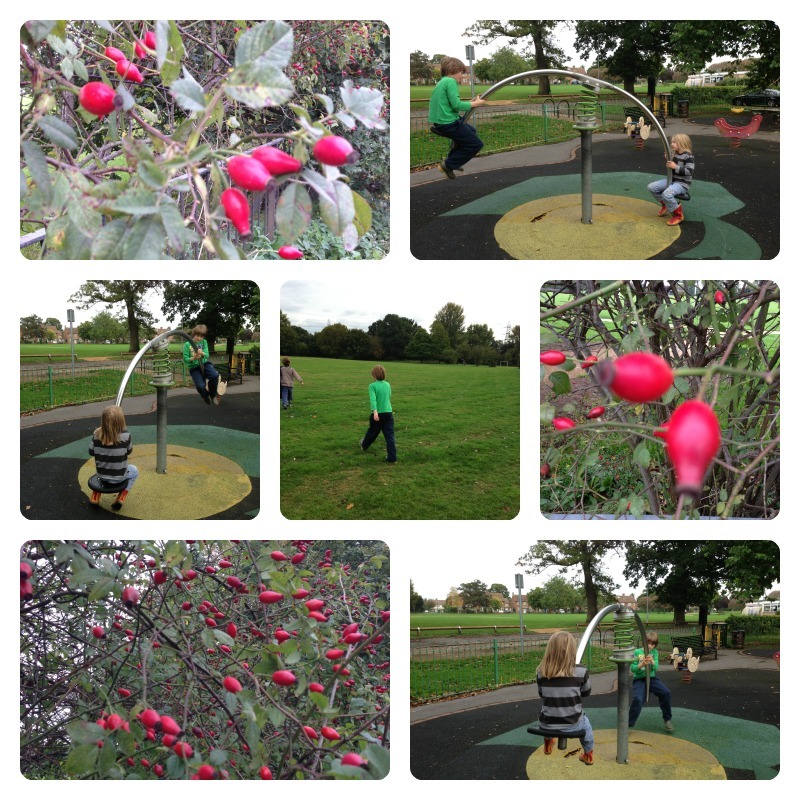 When we got up to the green, the children spent some time playing on the roundabout before starting their leaf hunt. 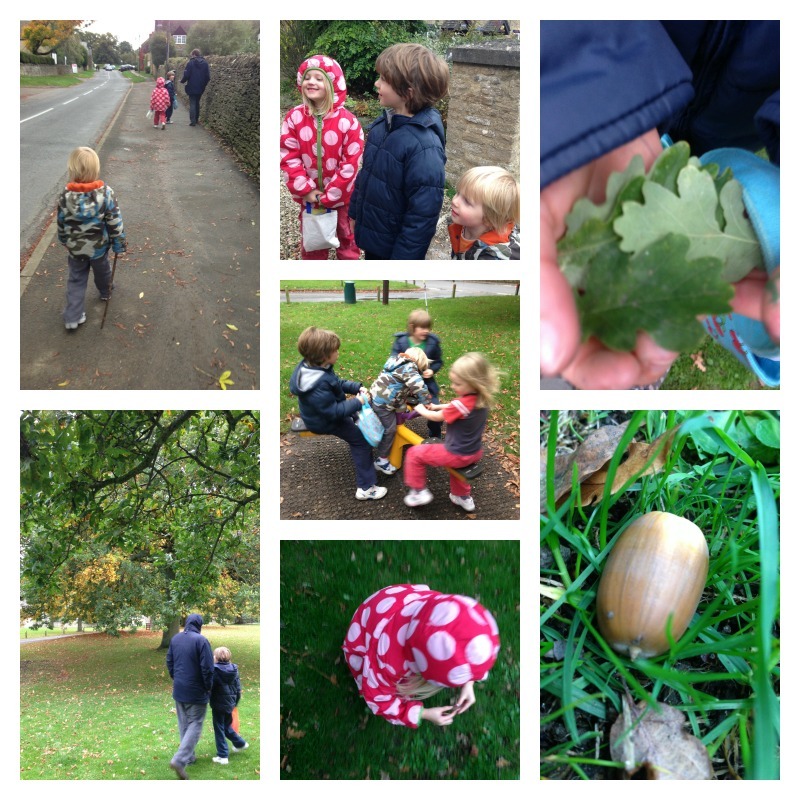 When we started looking, we found plenty of acorns very quickly, and then some conkers, and lots and lots of leaves of all different colours – beautiful but rather wet. Rabbit was very pleased to find a feather as well. 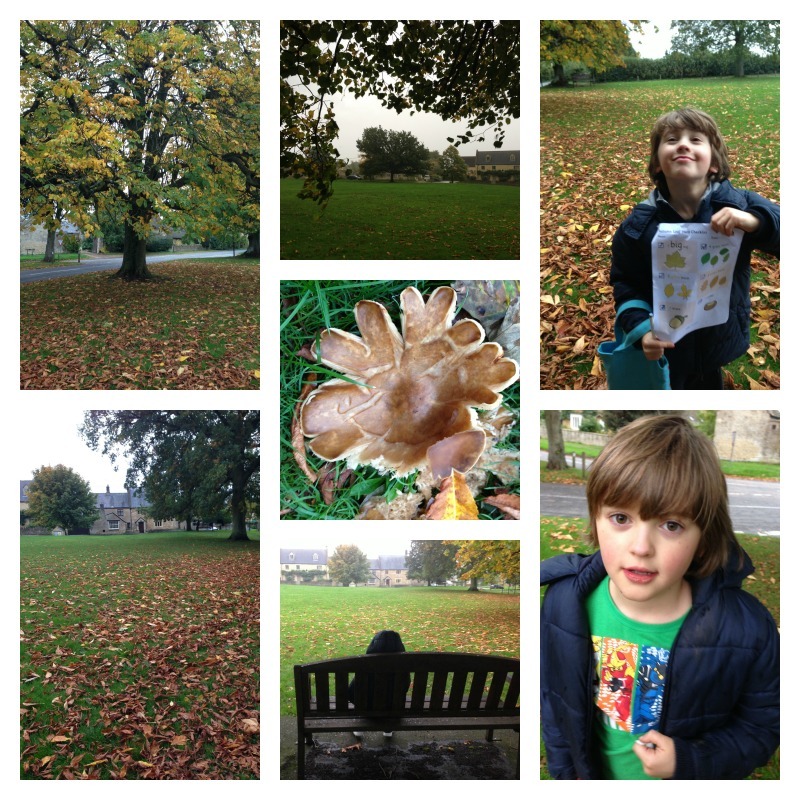 Tiddler just enjoyed showing me the leaves one after another which kept him busy for quite a long time. All the children completed their checklists. As you can see, Monkey was particularly proud! By this time, it was raining but we didn’t want to turn back just yet, as we really hadn’t been very far. So we continued for a little way, in the direction of the woods. On the way back across the green, we saw lots of mushrooms, which Rabbit and I decided must be a fairy garden or a fairy village. 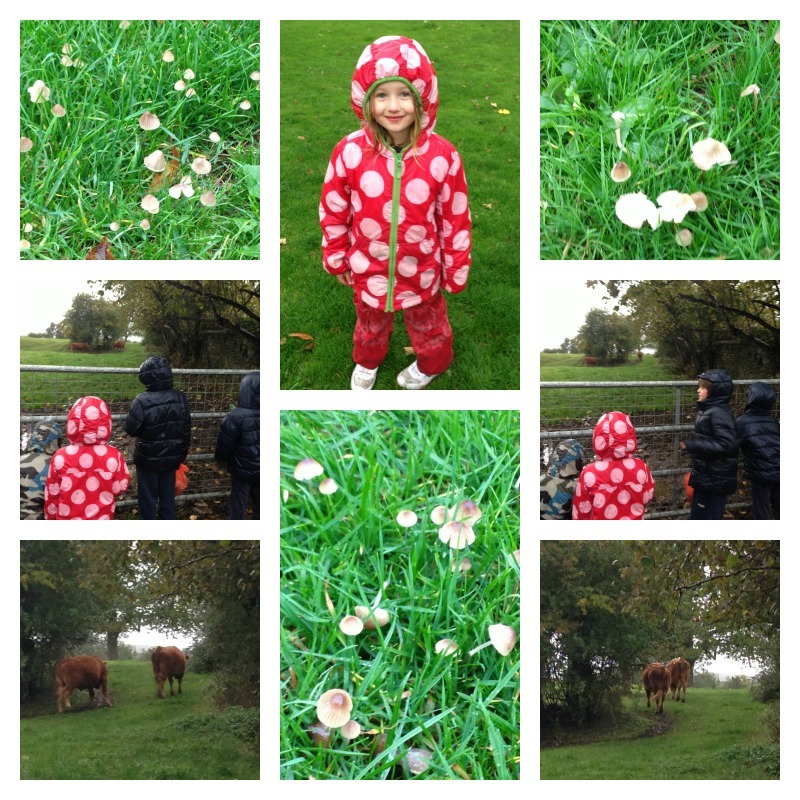 And as we walked back along the road, we stopped to look at the cows in the field half way along. Just before we arrived back at the house, we stopped one last time to pick some elderberries. 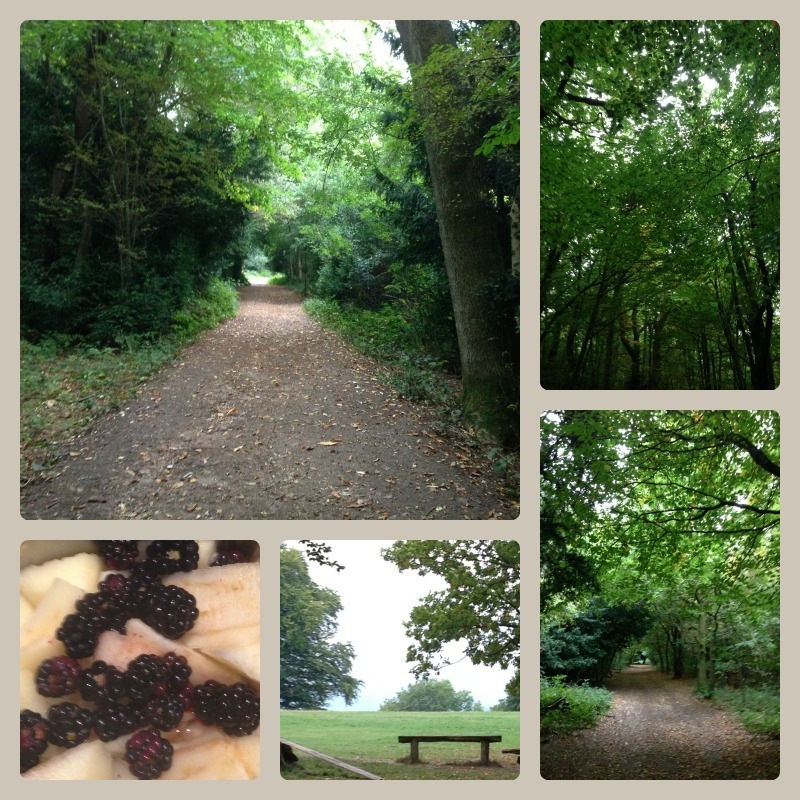 Despite the rain, it was a very enjoyable walk, though rather a short one. 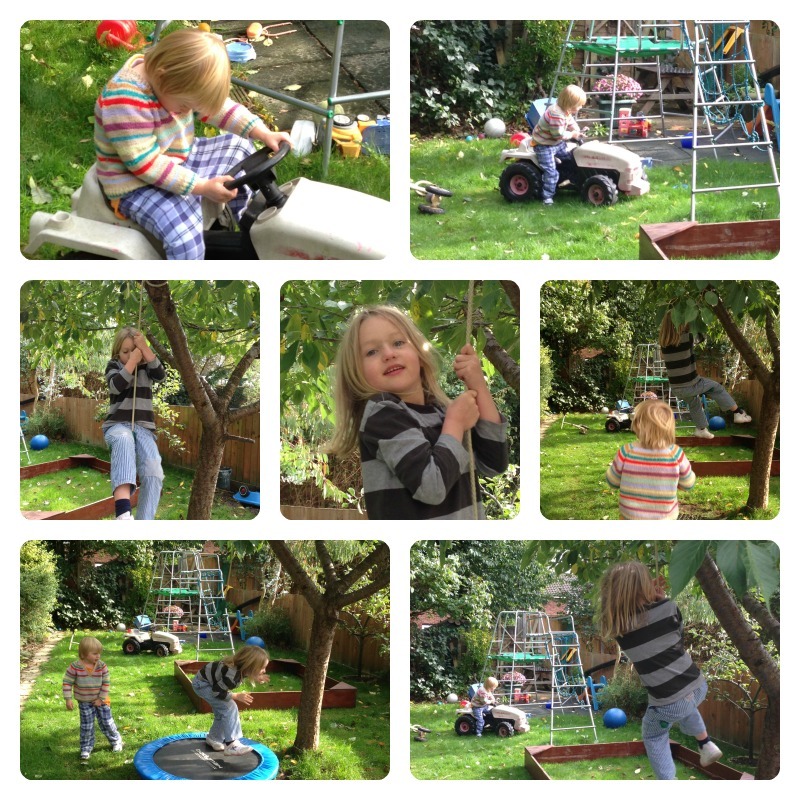 On Monday afternoon, after a morning in the house the children were needing to get outside for some fresh air again. This time we didn’t get any further than the garden, but we managed a bit of leaf art (Rabbit did the face, and Owl the rocket), Tiddler rode his bike and all the children played with a frisbee which kept them outside in the rain for quite a while! 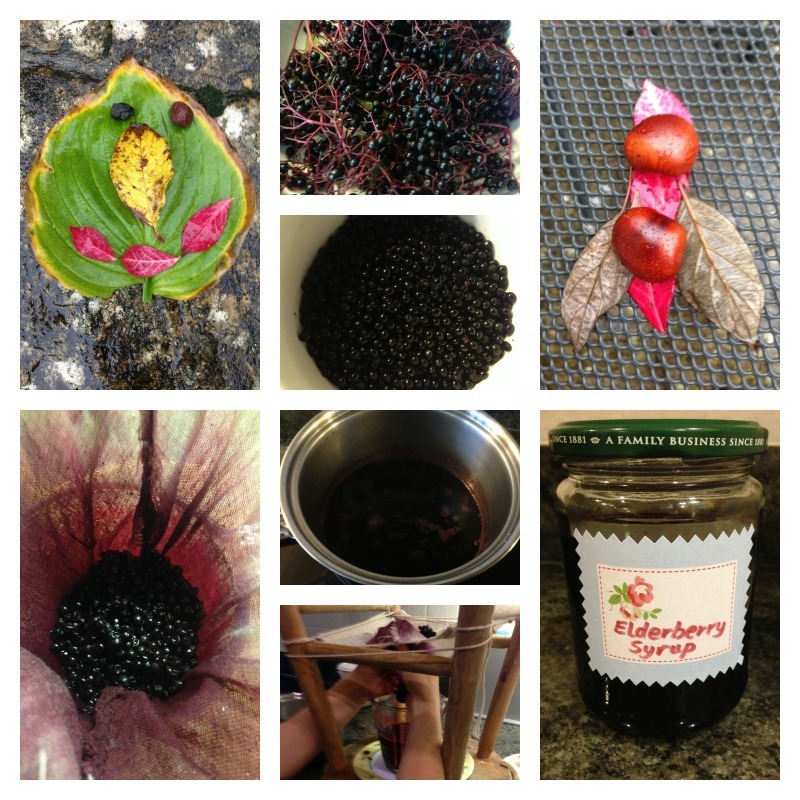 In the meantime, I made elderberry syrup with the berries we had collected the day before. I had enough to make one jar, which Owl and I are working our way through, and I don’t think it will last very long. We are just getting into our stride with collecting and producing it – I hope next year we will start earlier, and be able to make enough to give some away too. 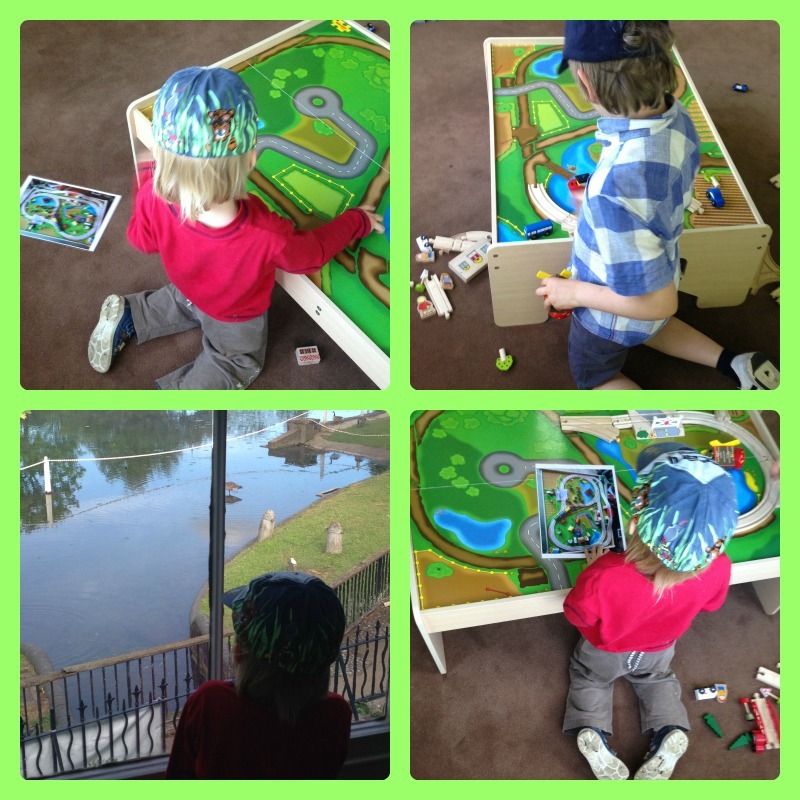 I’m linking this post up with a new linky I have just discovered, Entertaining and Educational, which asks “What have you and your kids been learning about?” I like the emphasis on learning together. 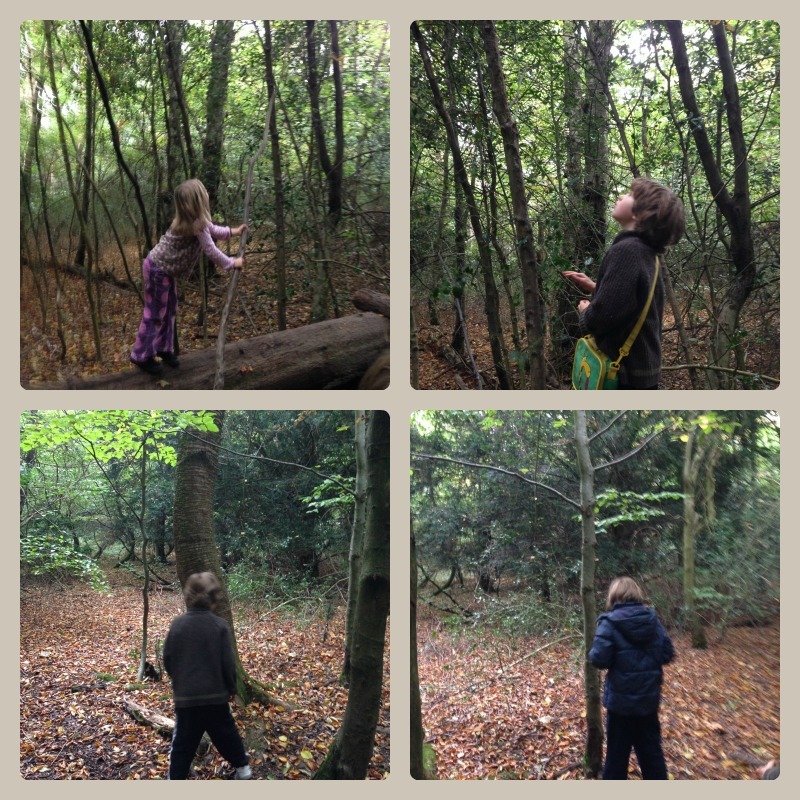 I may have been a little over-excited about foraging recently, but I hope the children will see that learning is not something that happens at certain hours, during term-time, or only while you are a child. I hope they will grow up knowing that learning is just something you do all the time, and it’s a lot of fun. 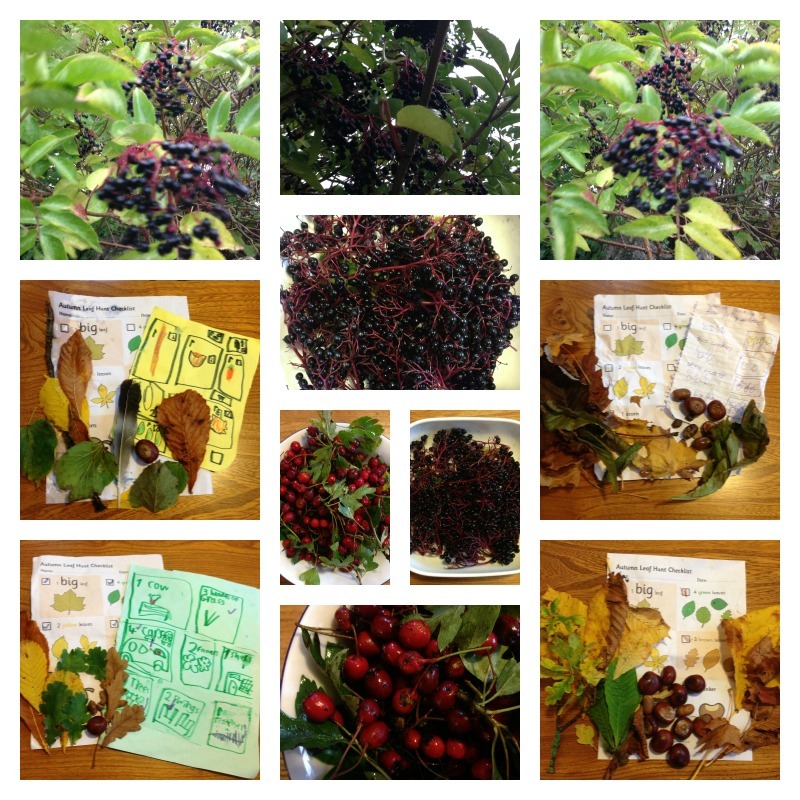 This entry was posted in Natural Childhood and tagged Autumn, elderberries, haw berries, leaf art, leaf hunt, twinkl on October 23, 2013 by Hannah. 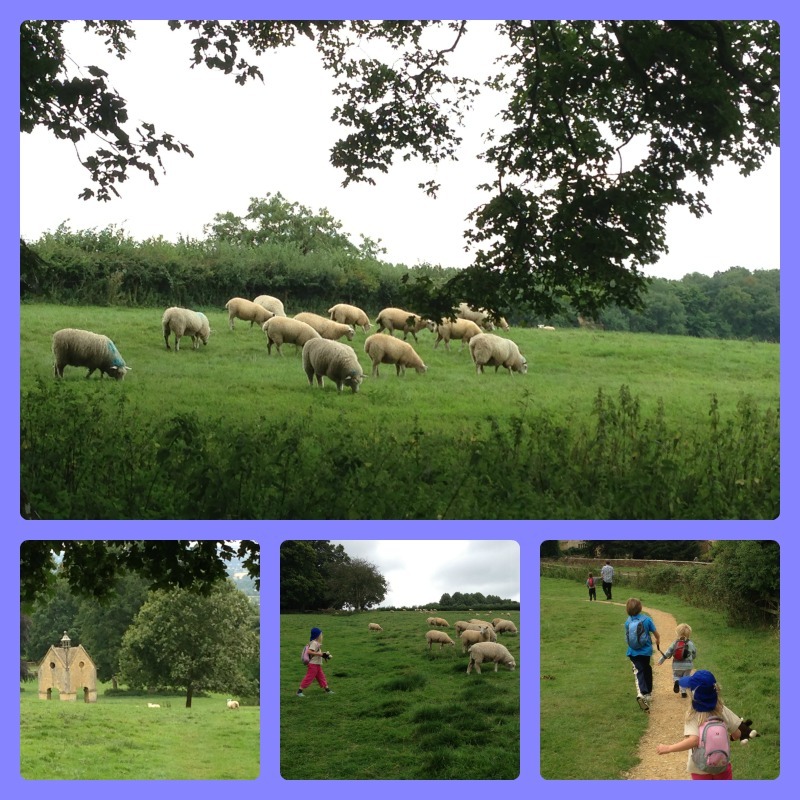 On the last two Wednesday afternoons we have been out with our Home Education group. 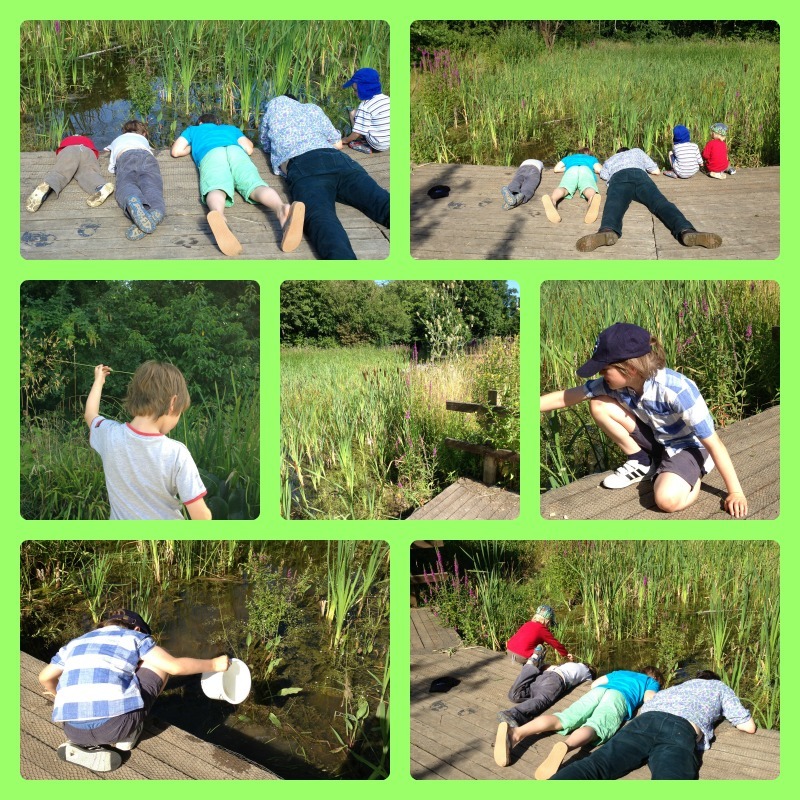 We have been enjoying the good weather, the fresh air and the freedom to explore and learn outdoors. 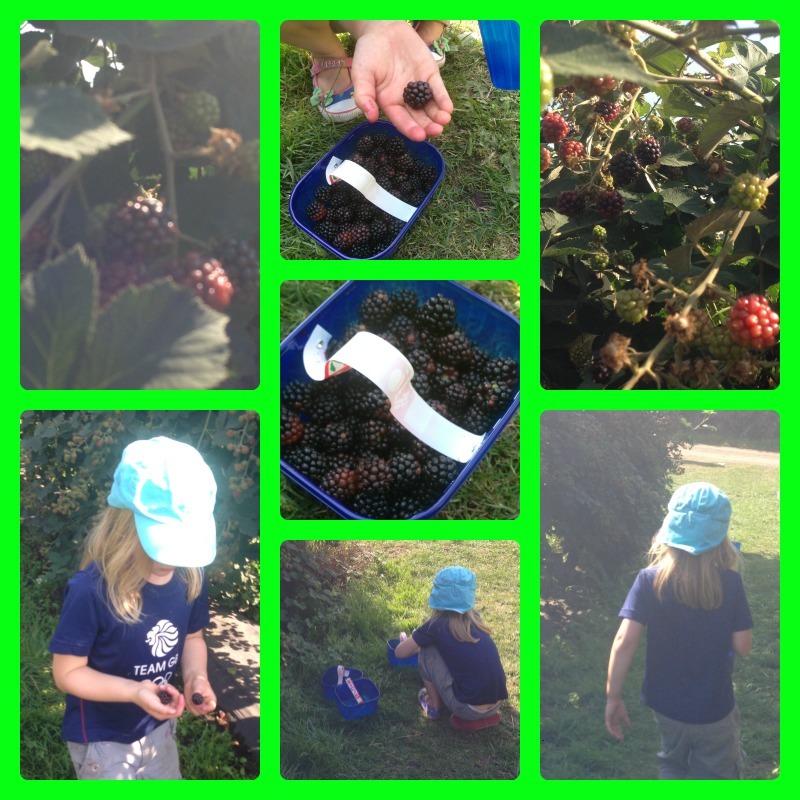 The week before last, we went haw berry picking at the local smallholdings where some of our home educating friends live. 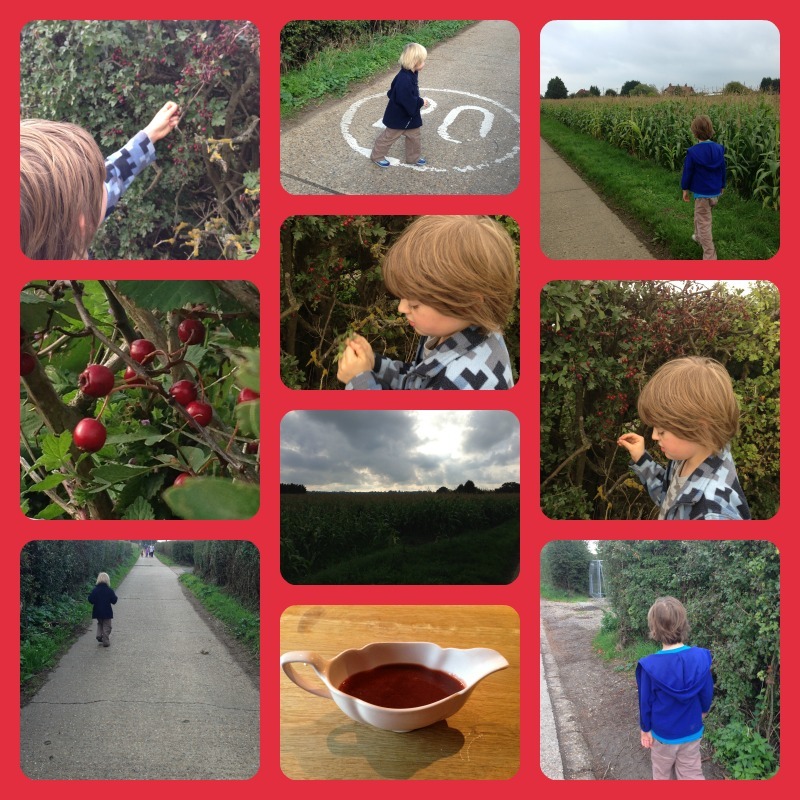 We had a lovely time, and got a small but reasonable harvest of berries. Owl was particularly keen and he really stuck at it to make sure we collected enough. 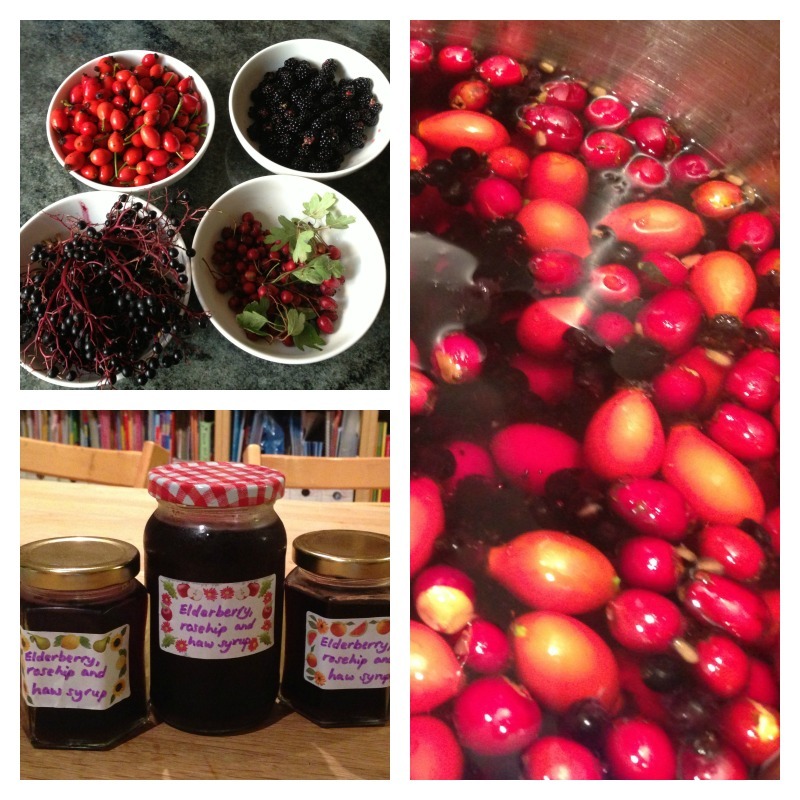 We used the berries to make haw sauce, which Owl, Daddy and I liked very much – the younger children weren’t so sure, but really I thought it was rather similar to tomato ketchup! It lasted a mere two days, so we need to go and pick some more berries before it is too late. 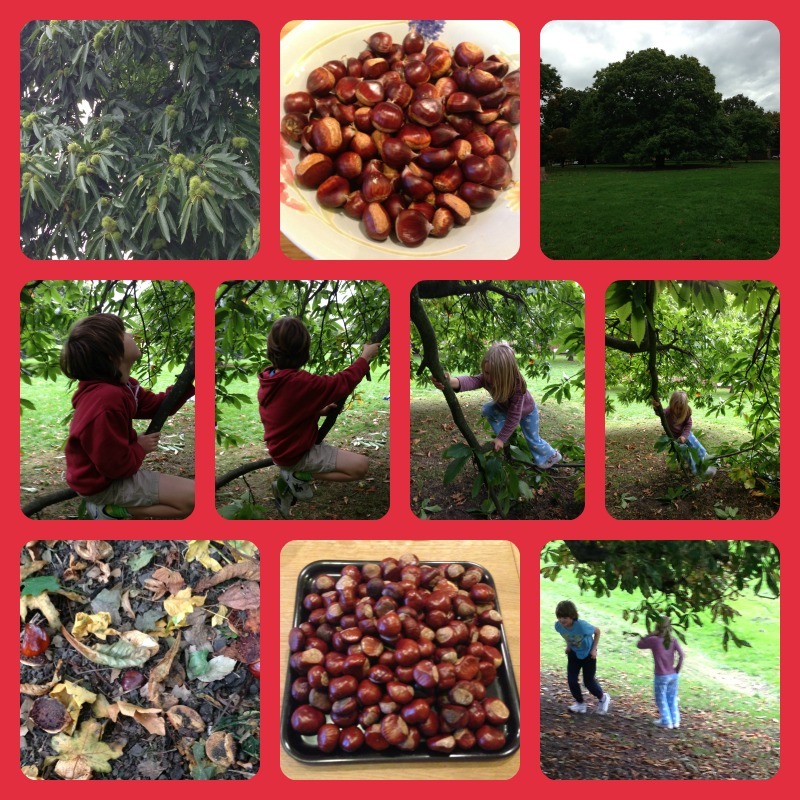 This week’s activity was chestnut picking in our local park. The same friend who took us haw picking taught us how to do it. 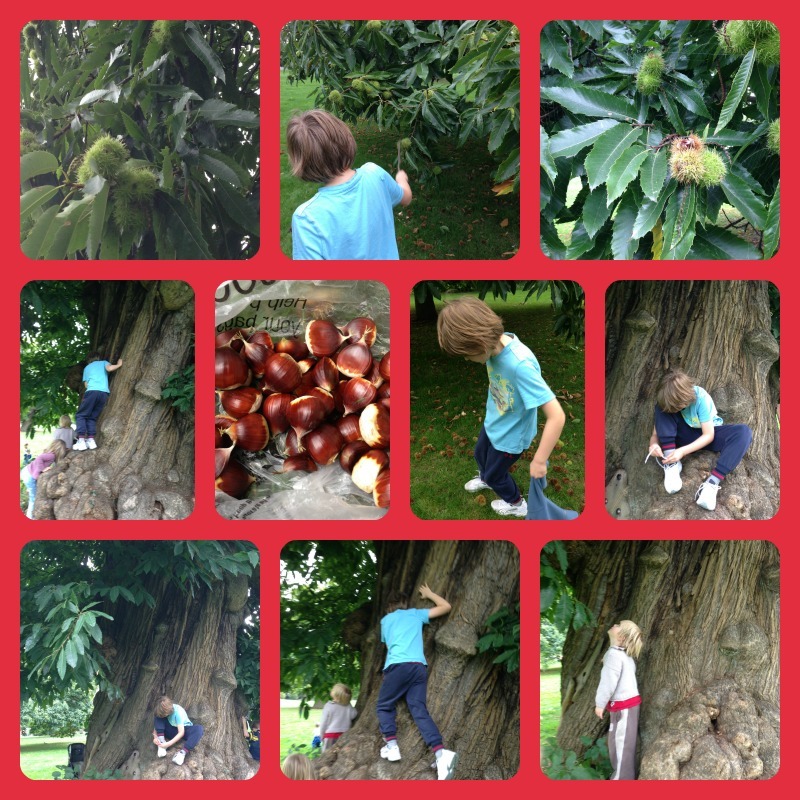 For the uninitiated, you hit the chestnuts with a stick to get them down and then stamp on them to remove them from their cases – so all in all, a very child-friendly exercise! 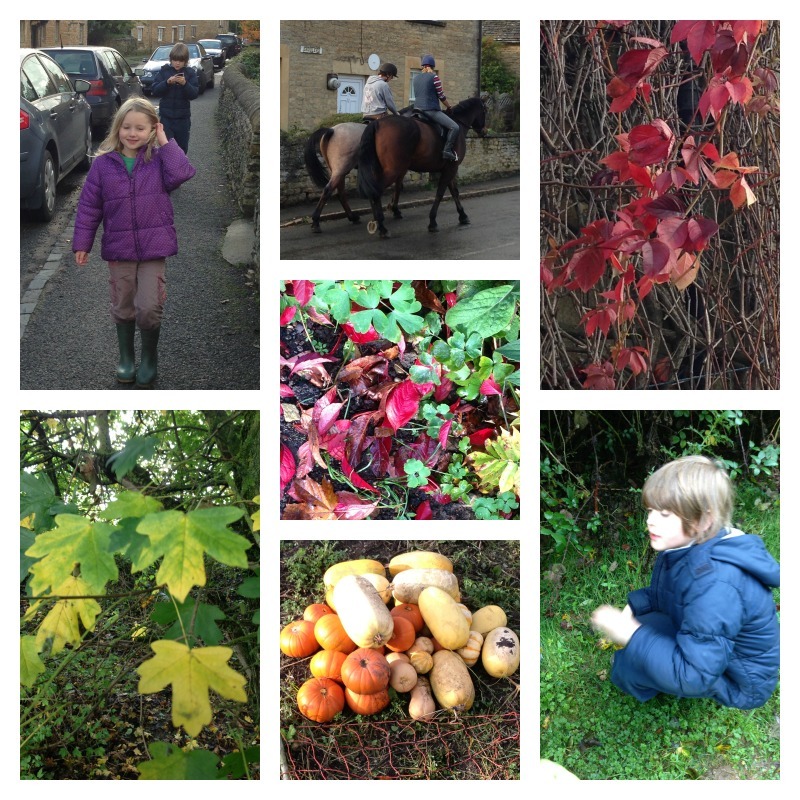 After a bit of tree-climbing and conker collecting, we returned home with our haul. We haven’t decided yet whether to roast the chestnuts or make soup with them. We are finding it difficult to choose so we will just have to go back to collect some more! 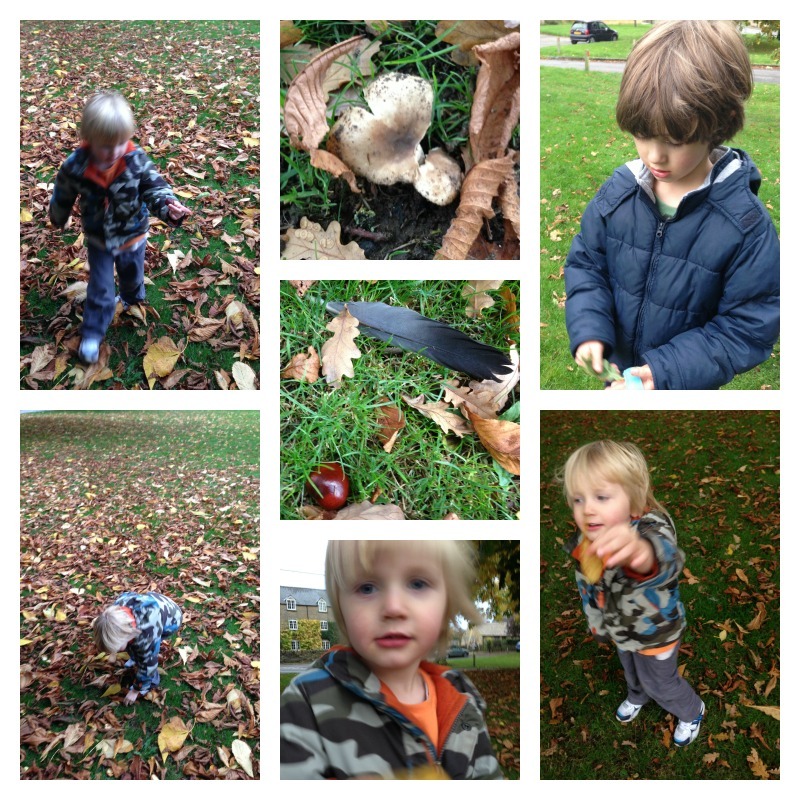 I love Autumn, it’s my favourite season, and there is so much fun to be had outdoors. 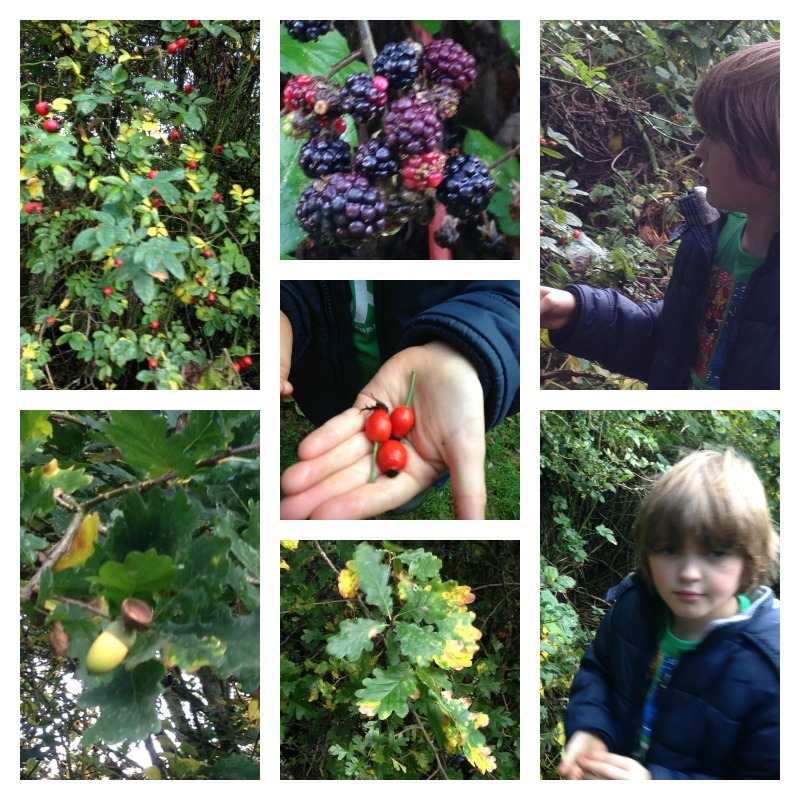 We always collect leaves and conkers, but this year we are all really enjoying learning more about foraging for food. I think that the freedom to do this kind of thing together is one of the things I like most about home education. I am grateful to my friends for sharing their knowledge and skills with us – it seems far more valuable to me than a lot of what goes on in school. I wish teachers had the freedom to take children out of the classroom and spend time outdoors doing things like this. The weather has changed now, so it might not be so idyllic but we are planning to carry on making the most of the Autumn bounty for as long as possible. Closer to home, we have plenty of apples and a few pears in our garden, as well as some pumpkins which we will be picking soon. This evening I went out in the dark and rain to pick some apples, feeling somewhat heroic, and Suburban Dad is now making chutney at nearly midnight. It might be a bit crazy, but there’s a great deal of satisfaction to be found in using free sources of food. The brambles might be over for this year, but we are not done with foraging yet! 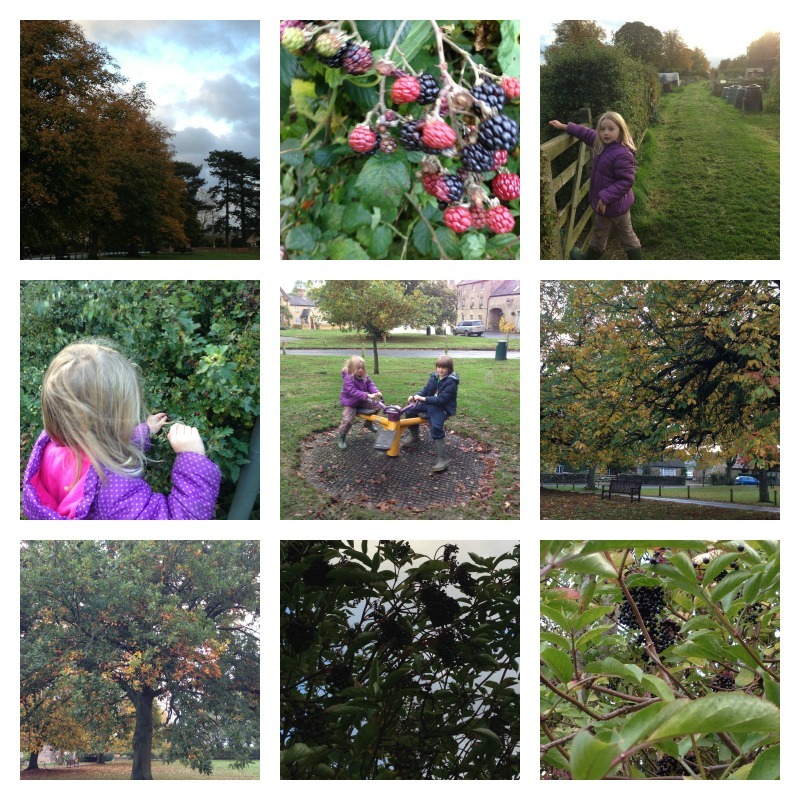 This entry was posted in Outings and tagged chestnuts, foraging, freedom, haw berries, nature on October 11, 2013 by Hannah. 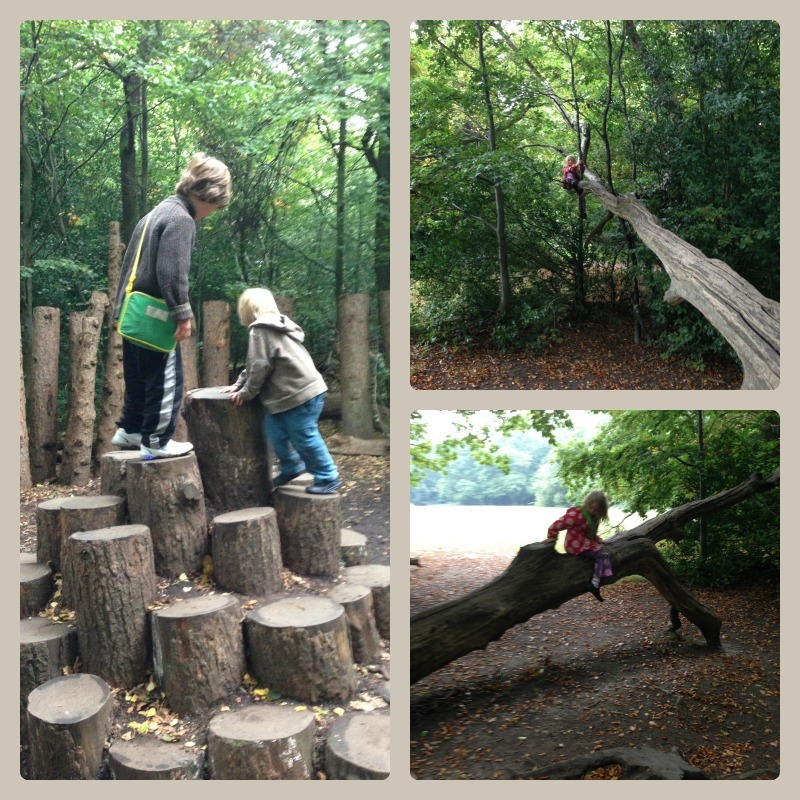 On Tuesday afternoon we went to Box Hill with our friends from 3 Kids and a Gluestick. We arrived after them, and they had already finished their picnic, so we took our packed lunches with us and set off along the Natural Play Trail. 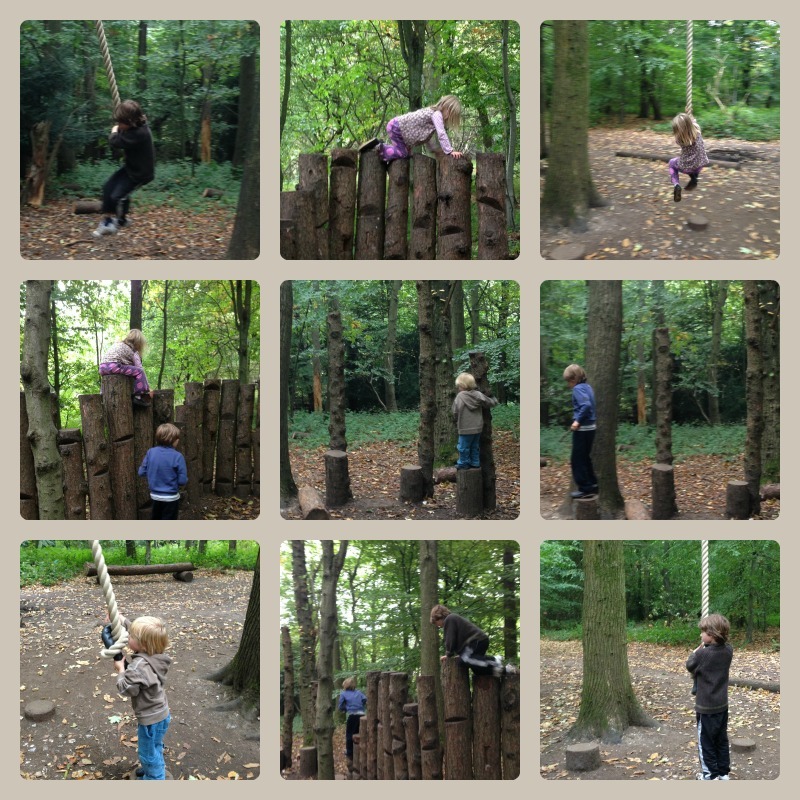 The children were very happy that there were lots of things to climb on – Rabbit in particular was in her element! 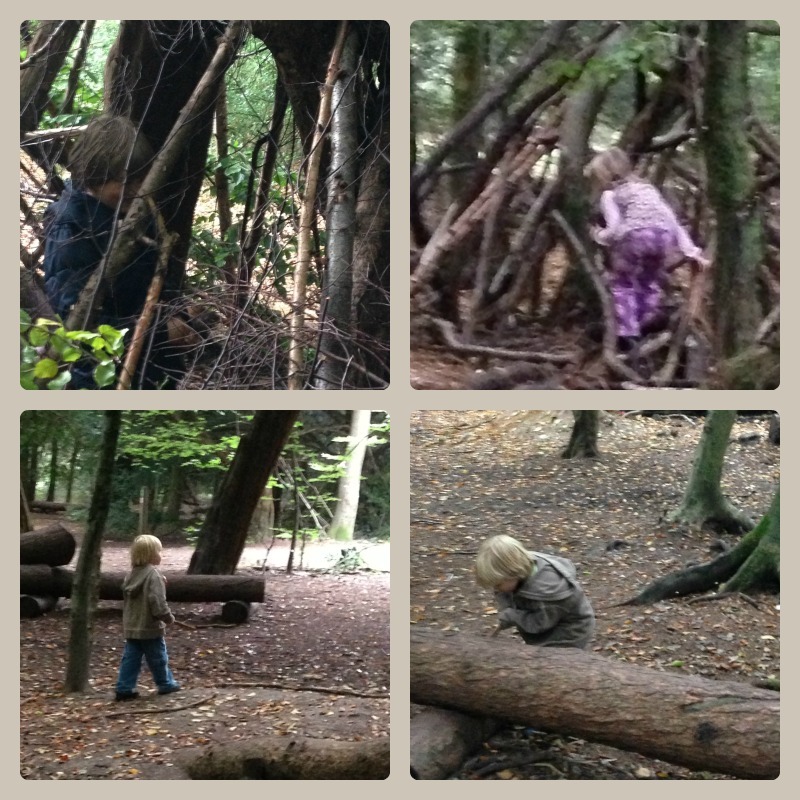 The children ate their lunch in the largest of several dens, and then explored some of the others. 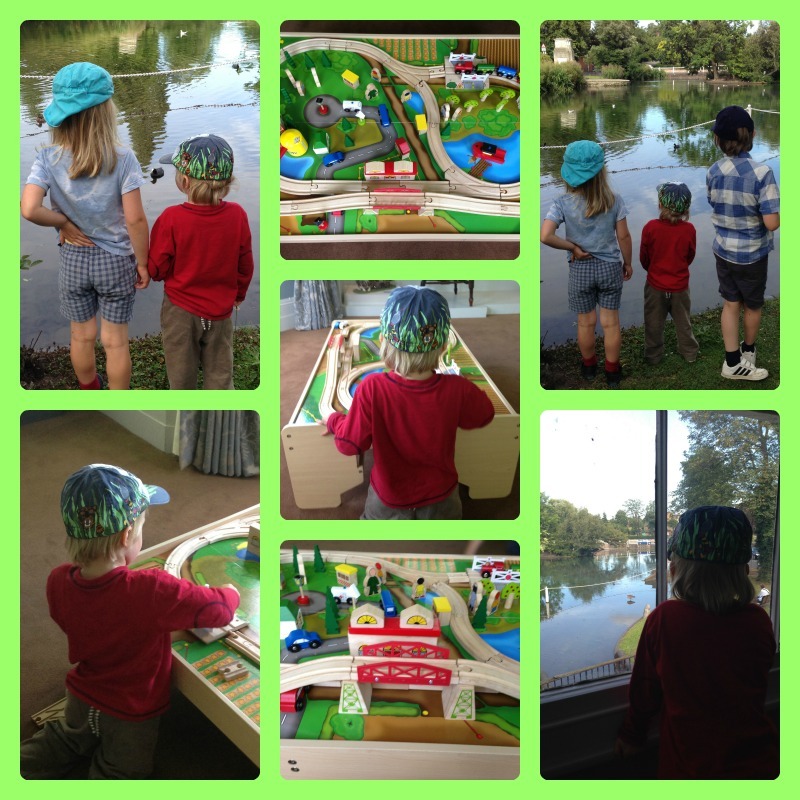 We really enjoyed exploring the play trail, and could have spent even longer there if we had had time. Owl managed to catch a falling leaf (one of the 50 things) and Monkey spent a long time trying to do the same. Luckily he succeeded at last. Rabbit and Tiddler didn’t manage it this time, but they had fun trying! We found out, from our friends, that you can eat the flesh of yew berries as long as you remove the black seed first (be very careful if you try this at home.) And Rabbit learned that it’s probably not a very good idea to go for a walk in the Autumn in your plimsolls! 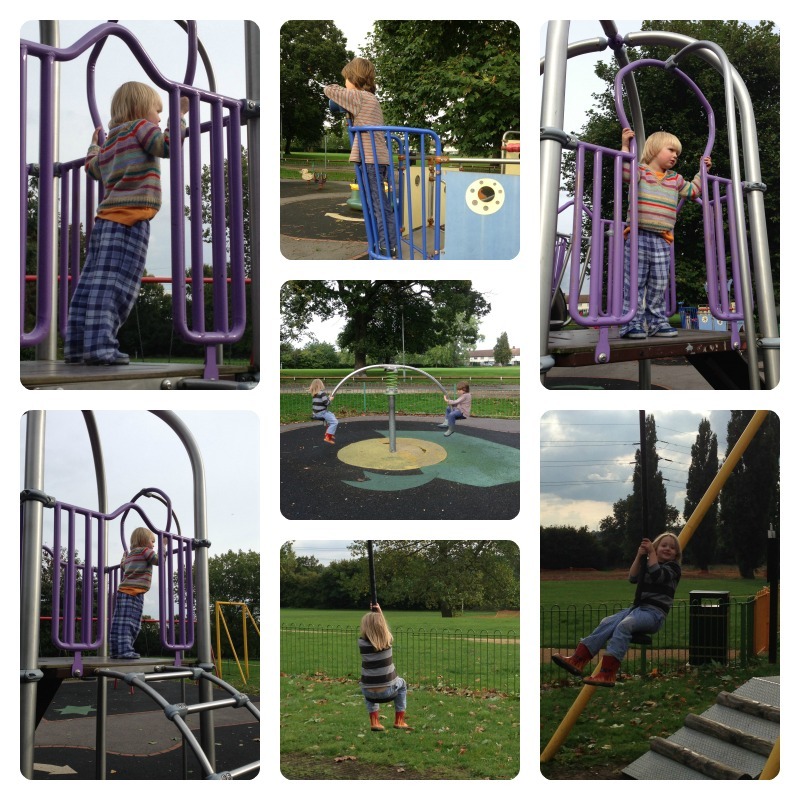 …especially as there were more things to climb on too. 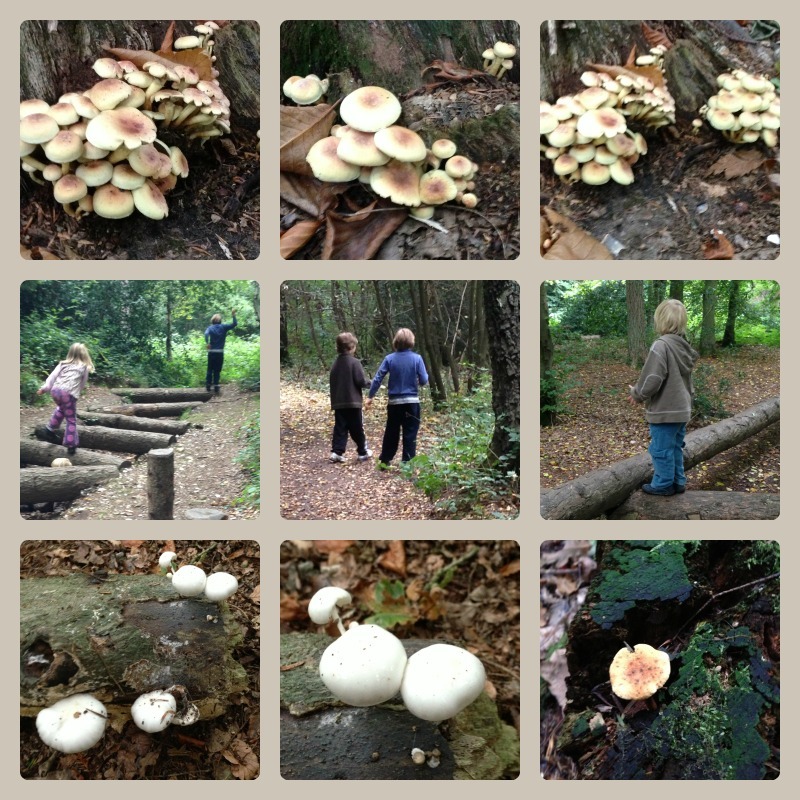 The children played trolls with their friends on the “trip-trap” bridges, while I took rather a lot of photos of fungi! We even managed to collect a few brambles. There were not many left, but enough to take home and cook with some apples from the garden – the perfect pudding after a quick supper of boiled eggs and toast because we were so late home. Box Hill is so near to us and I don’t know why we’ve never been there before. 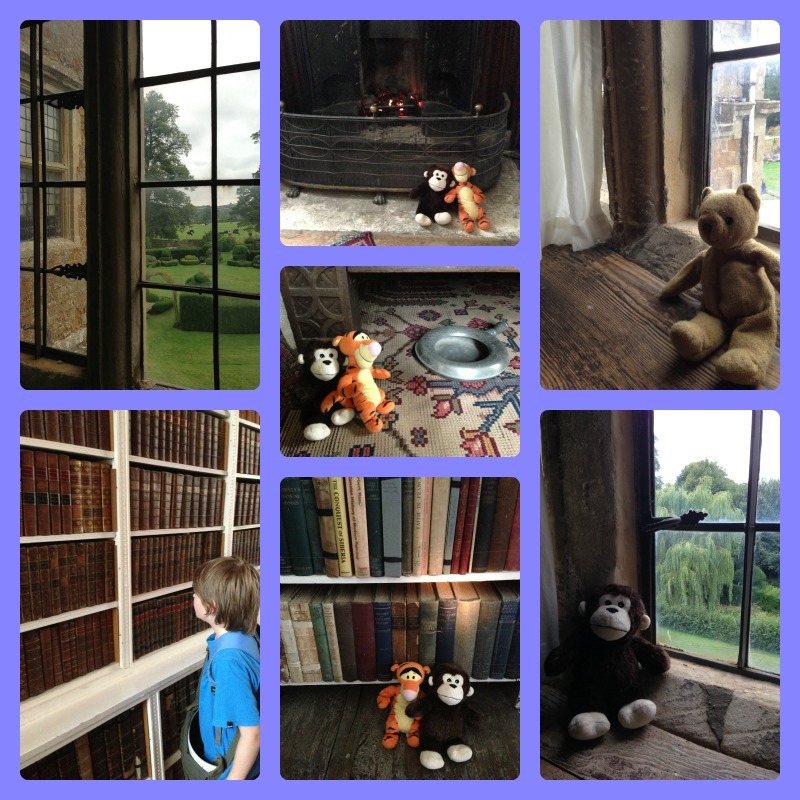 Monkey says it is his favourite National Trust place and keeps asking when we can go back, so I think we will be visiting again soon. 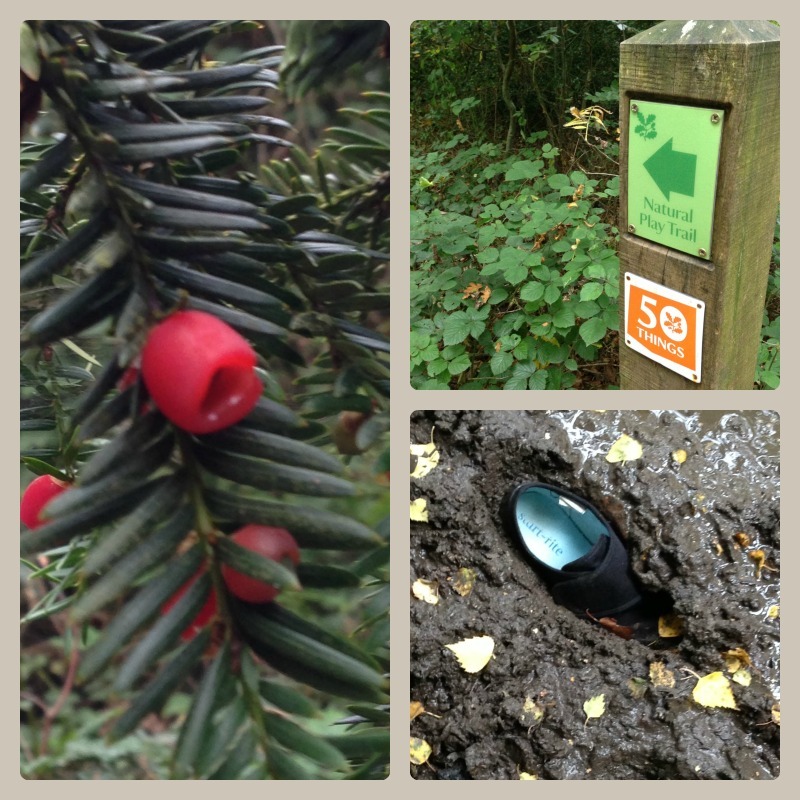 This entry was posted in National Trust and tagged box hill, National Trust on October 3, 2013 by Hannah. I’m still behind on blogging about what we’ve been up to, as always, and I’ll get round to telling you about our wonderful holiday in Wales eventually, but first I want to share a lovely afternoon we had with our friends from 3 Kids and a Gluestick about two weeks ago. After a morning at the swimming pool, we set off to meet them at Claremont Landscape Garden. We met up with our friends and had a picnic by the lake. 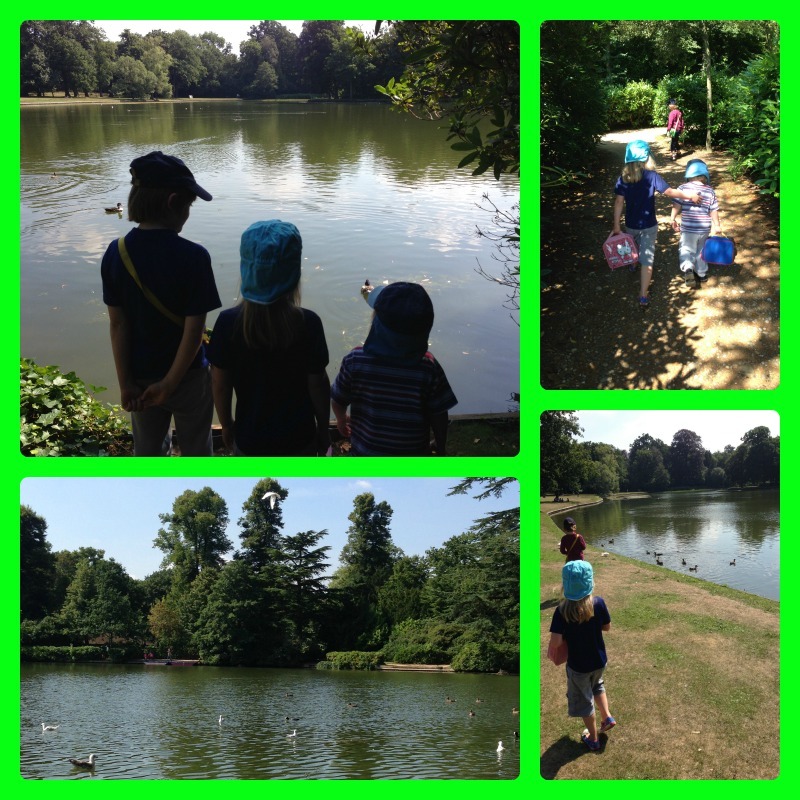 The children had a lovely time, though we had to work quite hard to stop them feeding their lunch to the ducks! 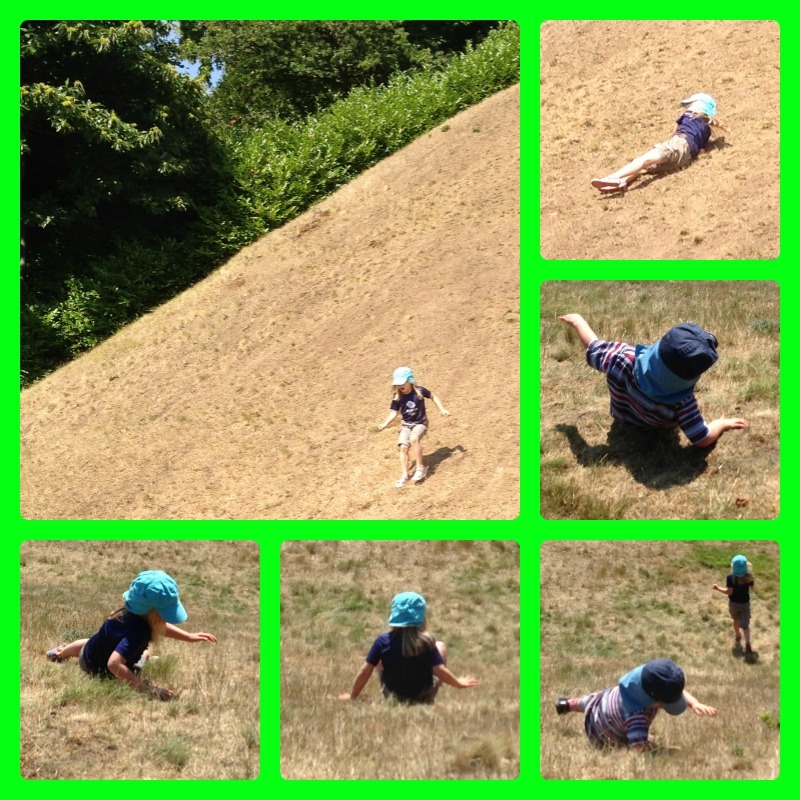 After lunch, they rolled down a really big hill – this is one of their favourite things on the National Trust #50things list so I think they will be doing it at every opportunity from now on. We weren’t there for very long, but there was time to play in the dirt, watch the ducks – and a heron – and go for a short walk round the lake. 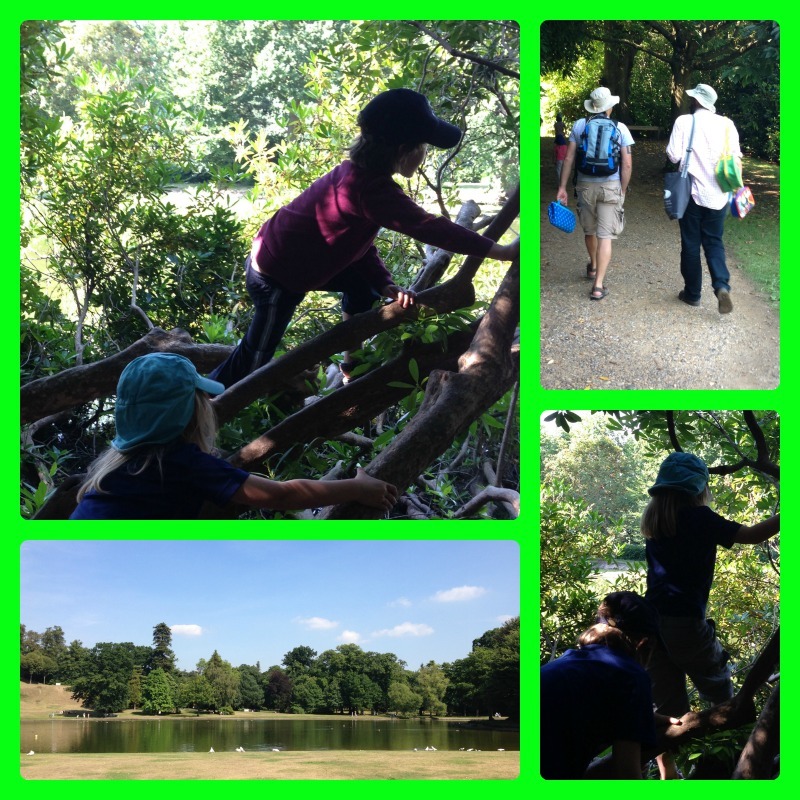 The children climbed trees, the dads chatted (and carried stuff) and the mums took photographs! 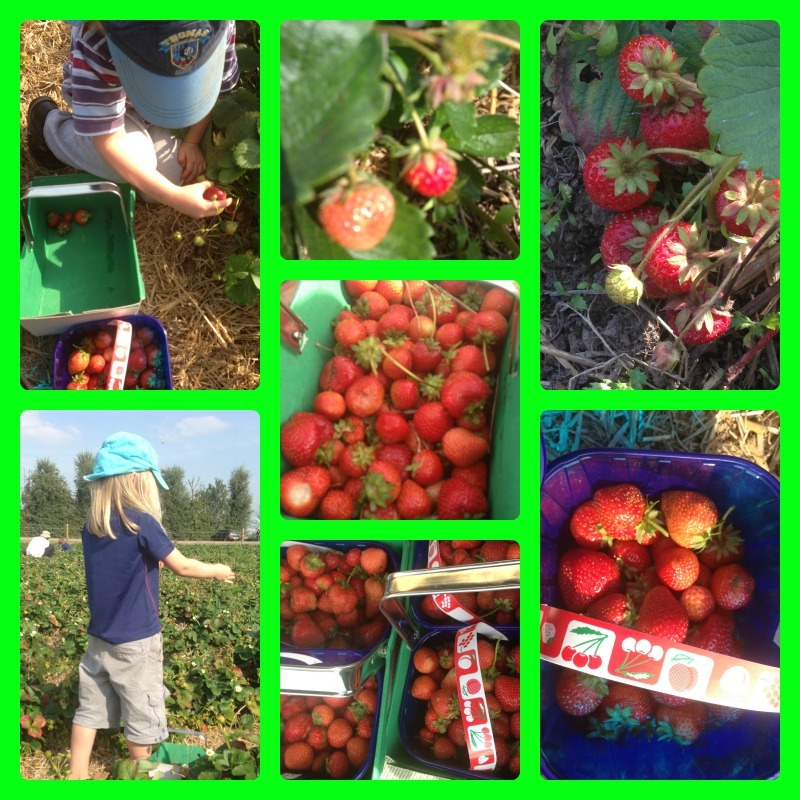 After finishing our walk, we left Claremont and drove for five minutes to our next stop, Garsons Pick Your Own Farm. First we picked carrots, beetroot, onions and cabbages. Then we managed to find just enough brambles that were ripe enough to pick. 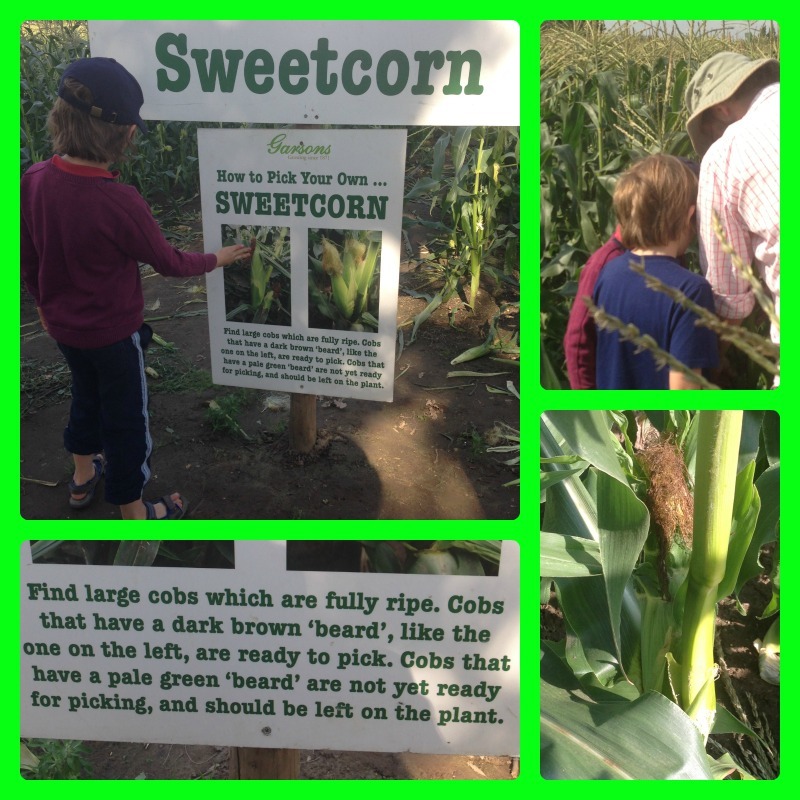 Next we picked some sweetcorn which was an interesting learning experience. 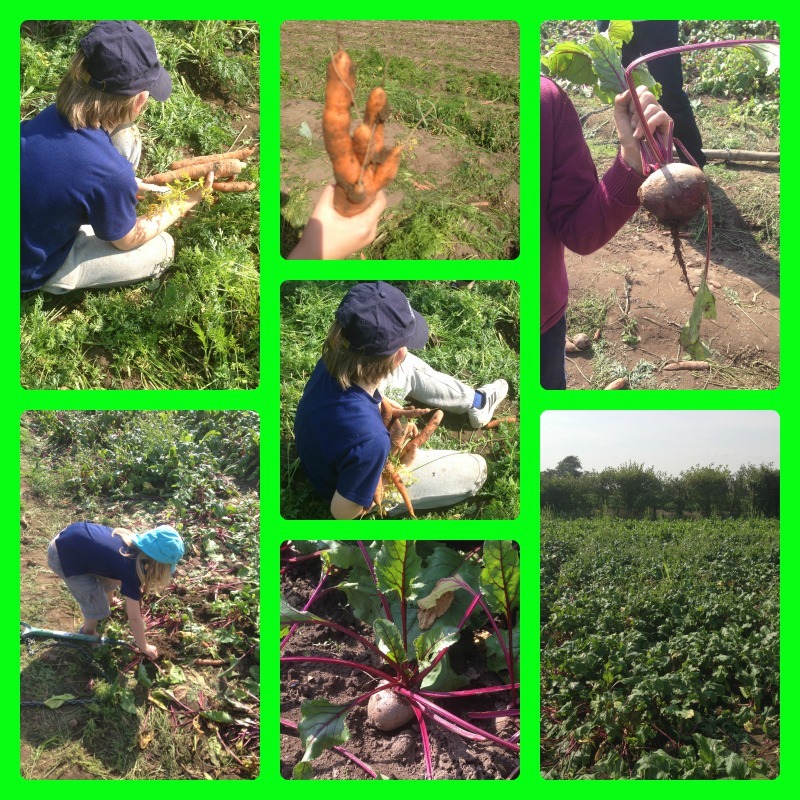 We were very glad to have our friends with us to prevent us from picking and buying unripe sweetcorn. It wasn’t as easy as the sign made it sound! And finally we picked enough strawberries to eat some that night and make the rest into jam. Daddy made the jam the next day, and it is delicious. We’ve been meaning to go to both Claremont and Garsons for a long time, and we had such a good time that I’m sure we’ll be going back again very soon. 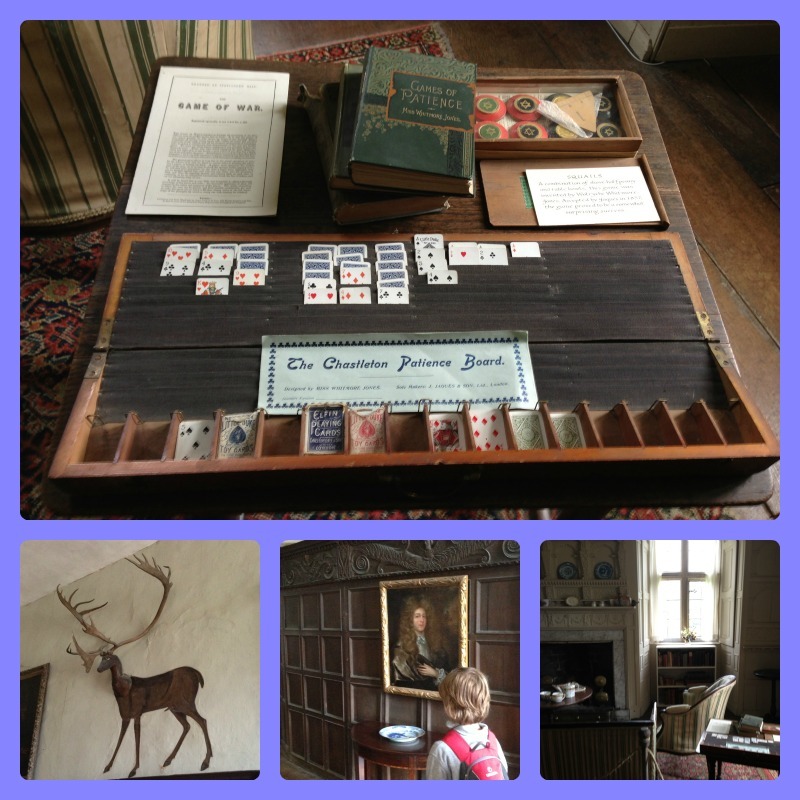 This entry was posted in National Trust and tagged Claremont, Garsons, National Trust on September 12, 2013 by Hannah. 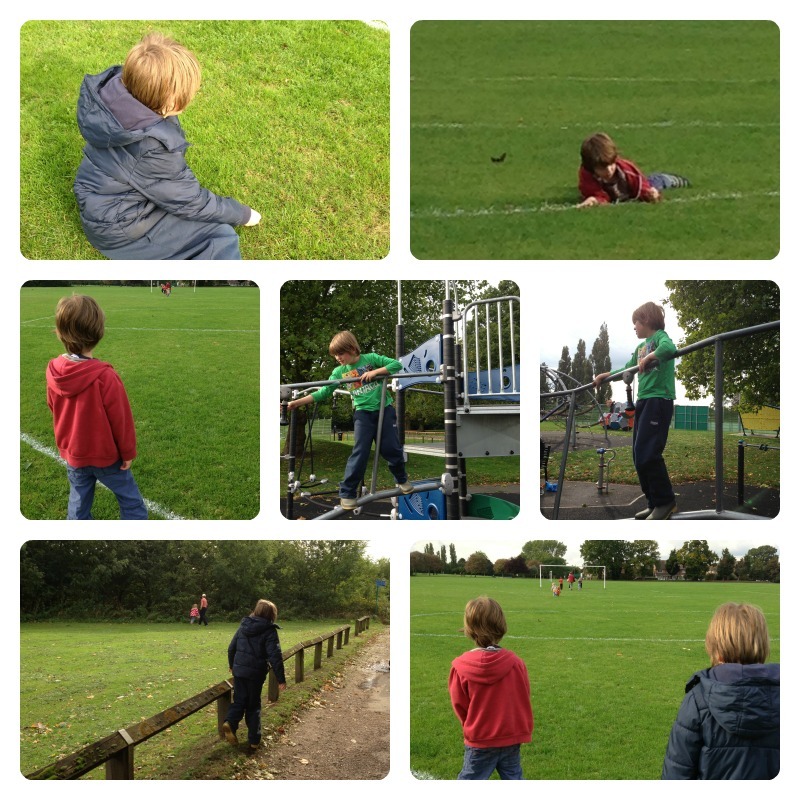 We are coming to the end of our late and extended summer holiday now, and I’m staying at my mum’s house which gives me a little time to reflect on what we have been up to and begin to catch up on all the blog posts that are pending. After a relaxed and quiet summer with the children at home, our family holiday time together with daddy started on Saturday 24th August. 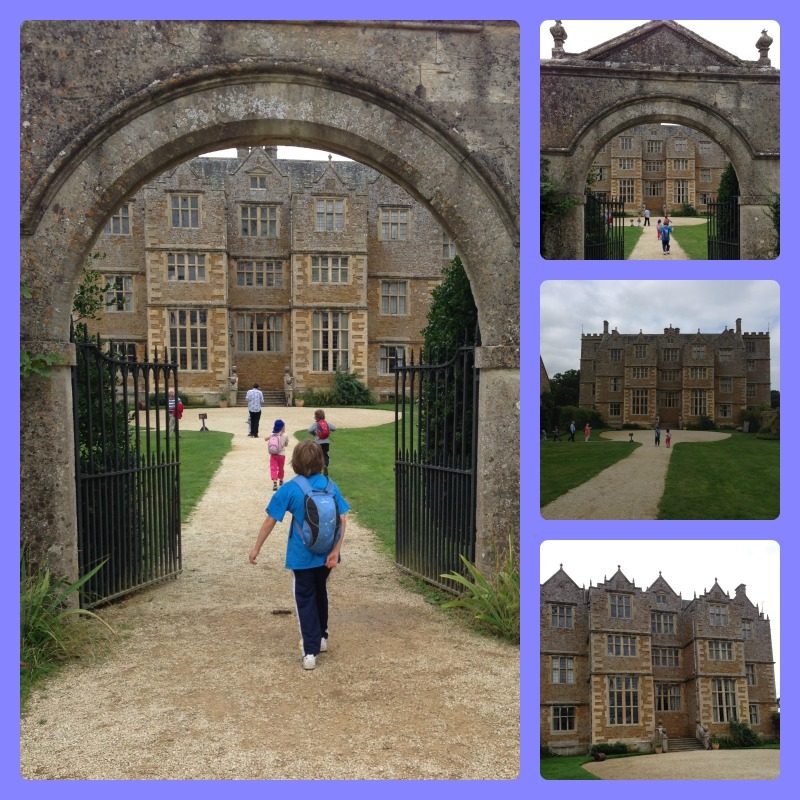 We were staying at mum’s then as well, and we had a lovely afternoon at our favourite National Trust property, Chastleton House and Garden. We got a timed ticket to enter the house shortly after we arrived, picking up an explorer backpack for the kids on the way in. We have learnt from experience that it’s best to have one, not four, or we end up carrying them all! The children were happy to share the binoculars, torch and magnifying glass which added a bit of fun without being too much trouble. I thought we might have to move fairly quickly round the house but in fact we spent quite a long time in there. 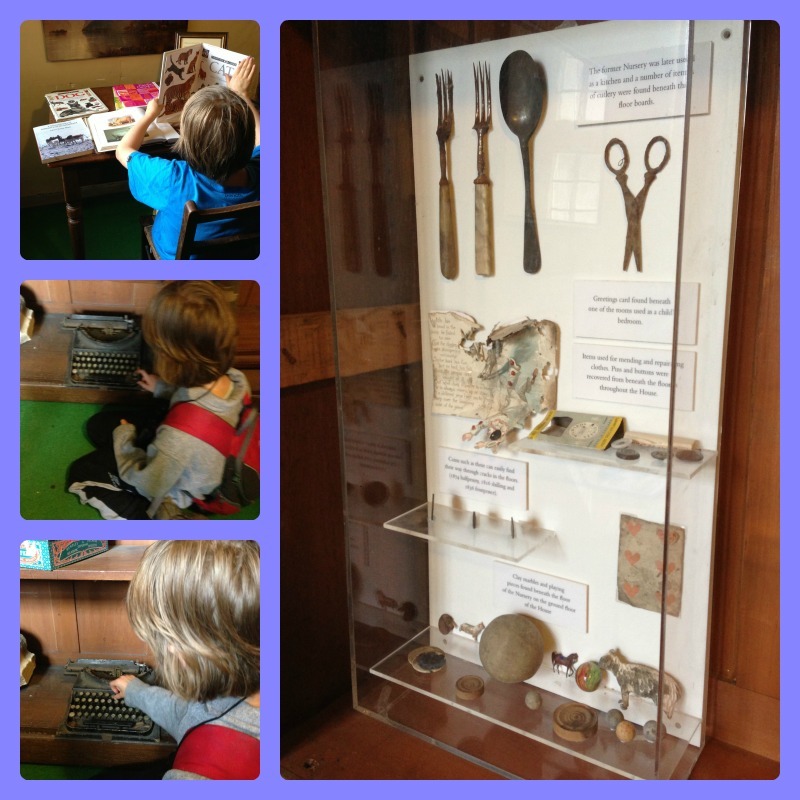 I was impressed by the children’s ability to concentrate and they all found something of interest in every room. Owl would have spent even longer there if he could, particularly in the reading room. Monkey was fascinated by the typewriter and it felt strange to have to explain what it was! I really enjoyed looking at the wood carvings around the house, and I think it would be fun to go back with sketch books sometime and draw some of them. 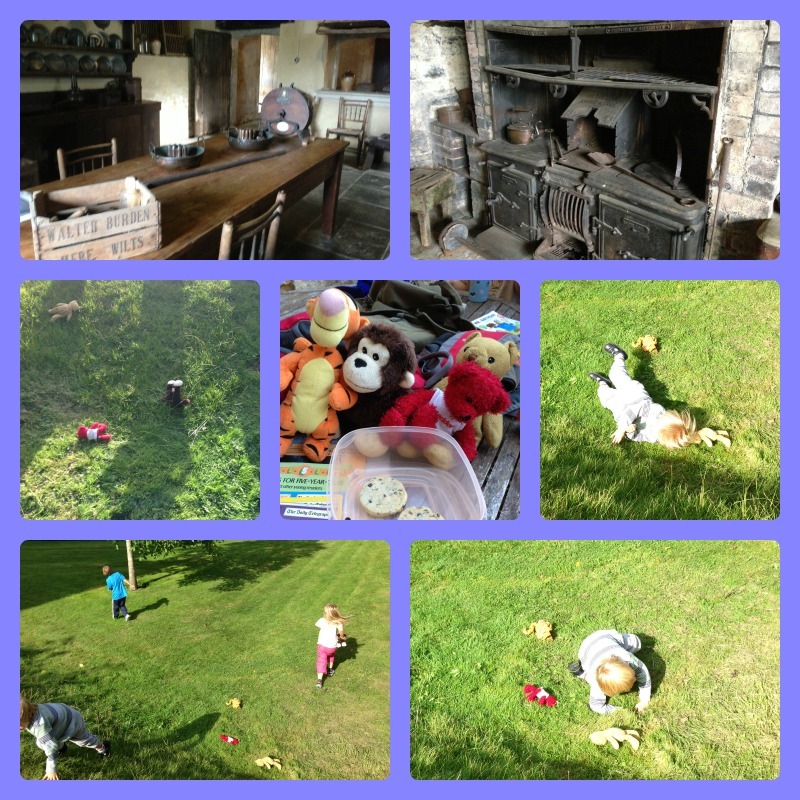 About half way round, I remembered that I had told the children we could take photos of their cuddly toys in the house which added a new dimension and kept them interested for longer. Owl and Rabbit especially liked posing their toys next to a chamber pot under one of the beds, and they found out that it is one of the oldest items in the house. 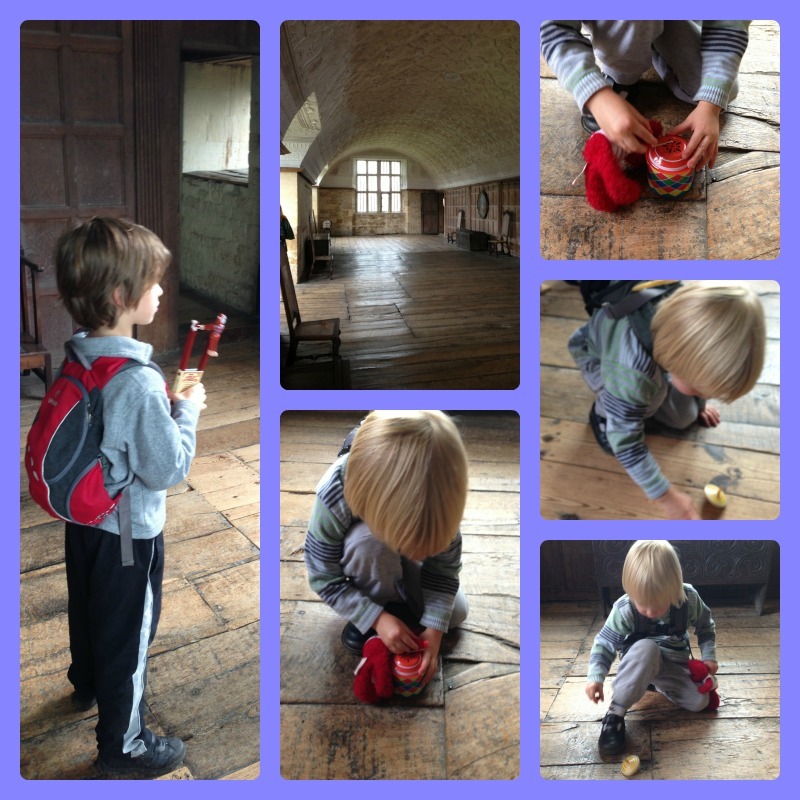 As always we spent a lot of time in the long gallery at the top of the house, testing out the toys. 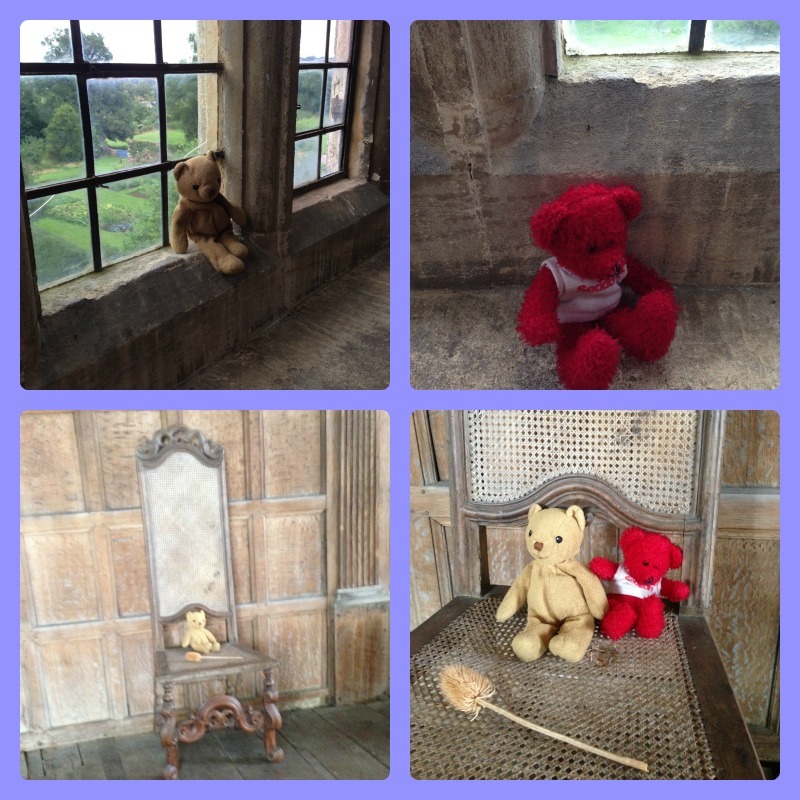 The teddies posed for a few more photos too. After a quick look in the kitchen, we came out to the courtyard for a snack and a bit of browsing in the second hand bookshop. Then we headed out to the garden to enjoy the late afternoon sunshine. All the children – and the toys – rolled down the slope which just about covered one of our #50things though it wasn’t exactly a big hill. 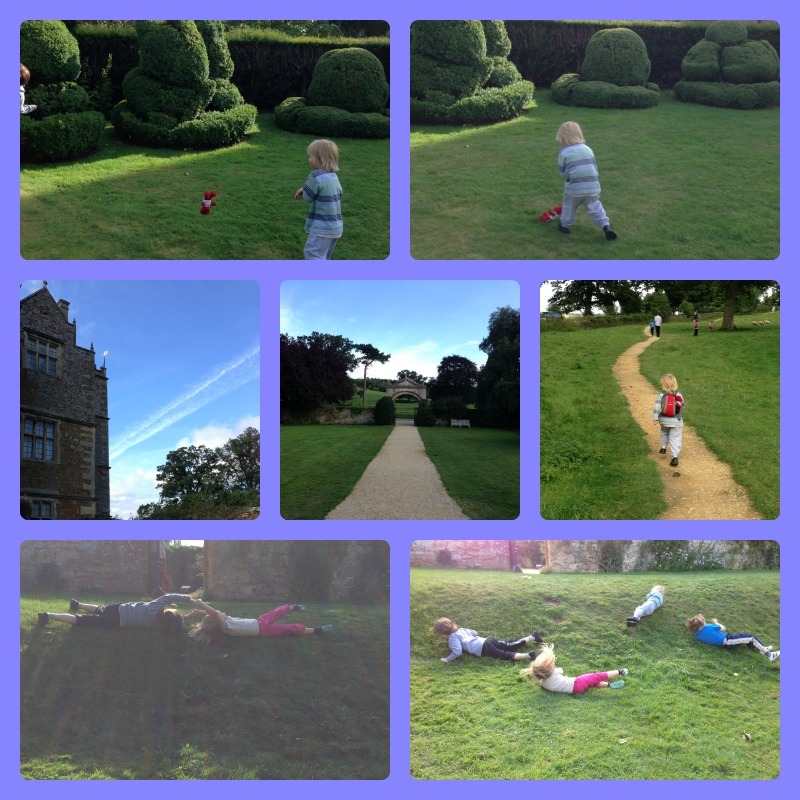 The toys – and the children – enjoyed the topiary. 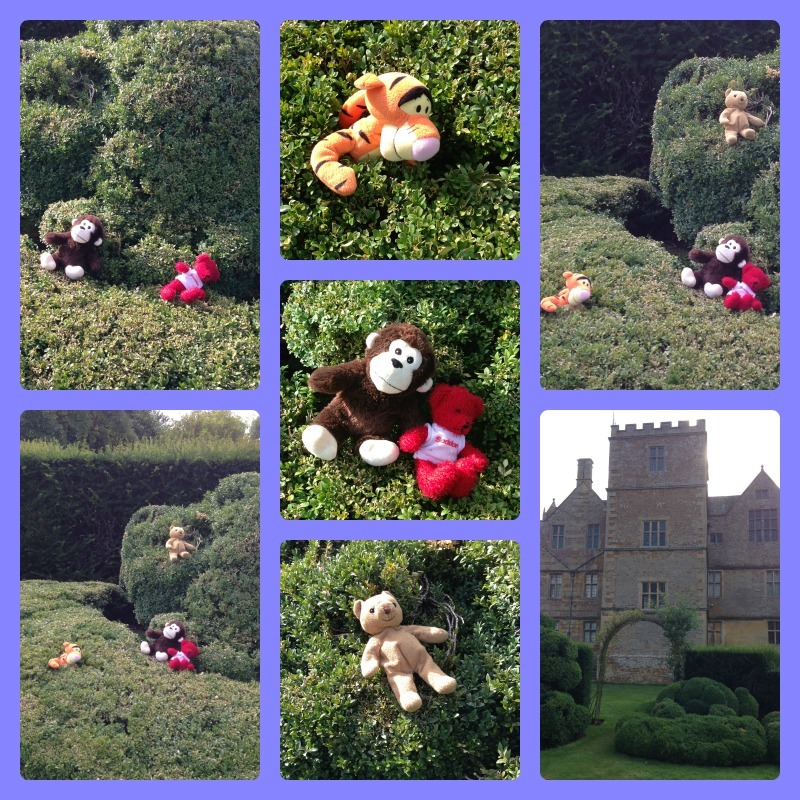 They were happily occupied for a long time hiding in the bushes, jumping out and making the toys do the same. 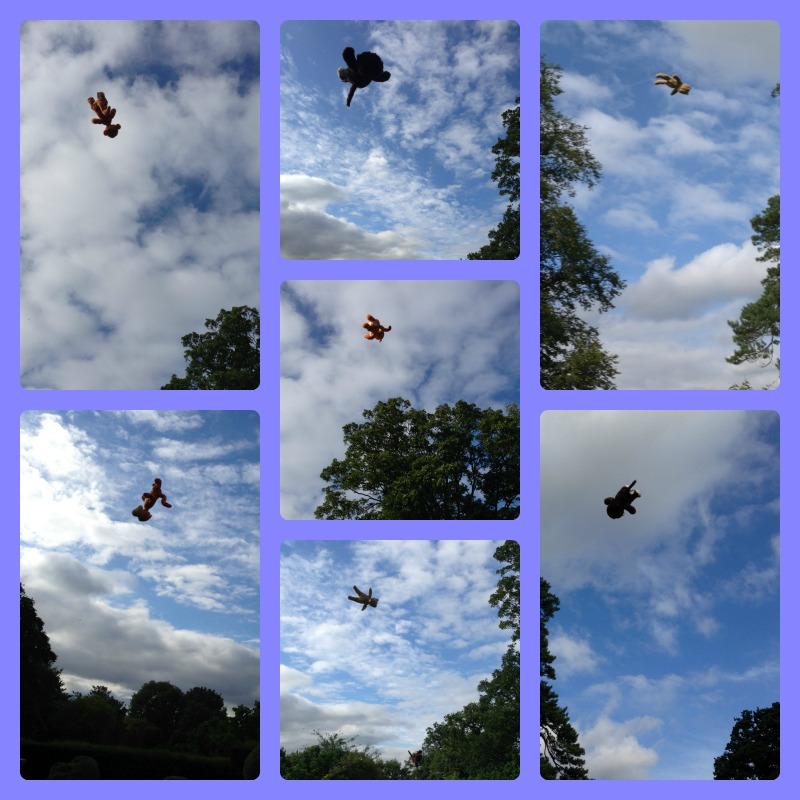 Then – I’m not quite sure how this started – the toys did a bit of sky diving. Owl, Monkey and Rabbit (with some help from daddy) threw their toys up as high as possible over and over again until they were satisfied that I had taken some good enough photos. Tiddler had a go too, but his teddy didn’t get quite so high up. There was just time for another roll down the slope and then we had to leave. A little stroll back to the car park, with a chance to say goodbye to the sheep on the way, rounded off a lovely afternoon perfectly. 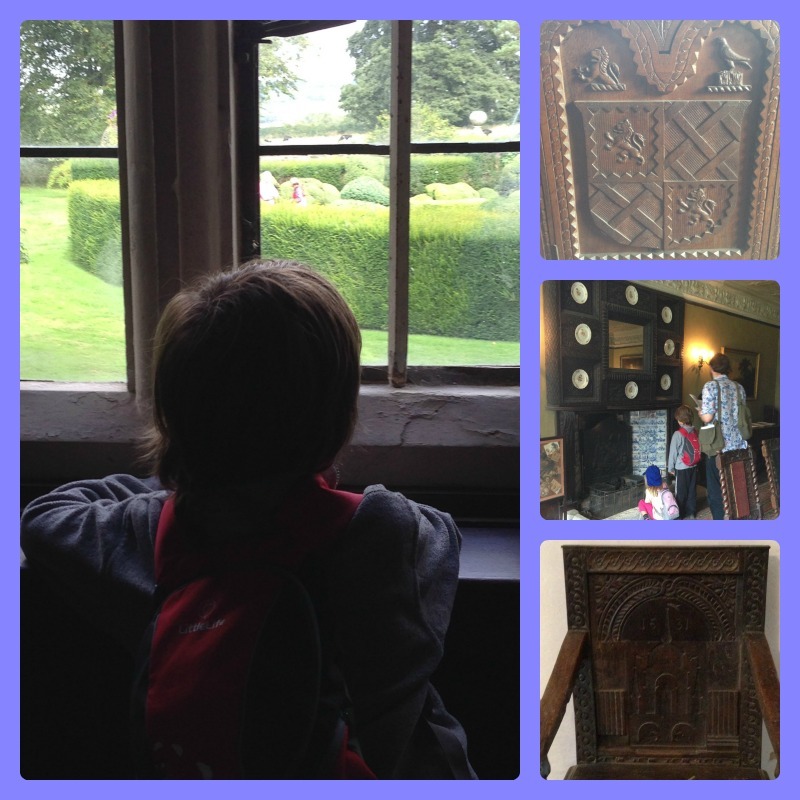 This entry was posted in National Trust and tagged #50things, Chastleton, National Trust on September 11, 2013 by Hannah. 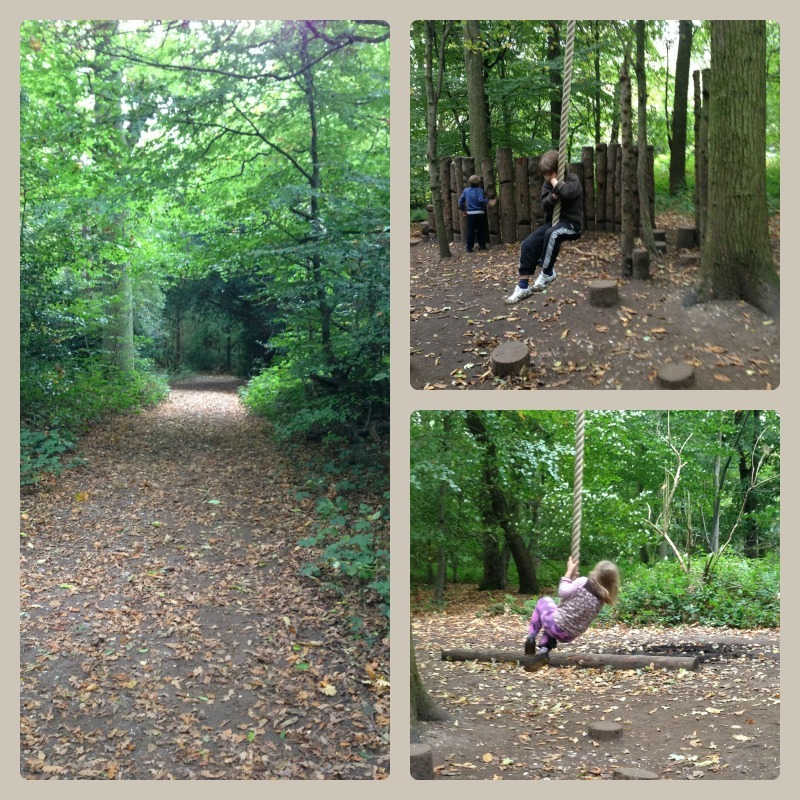 On Wednesday we went for a walk in the woods with our Home Education group. 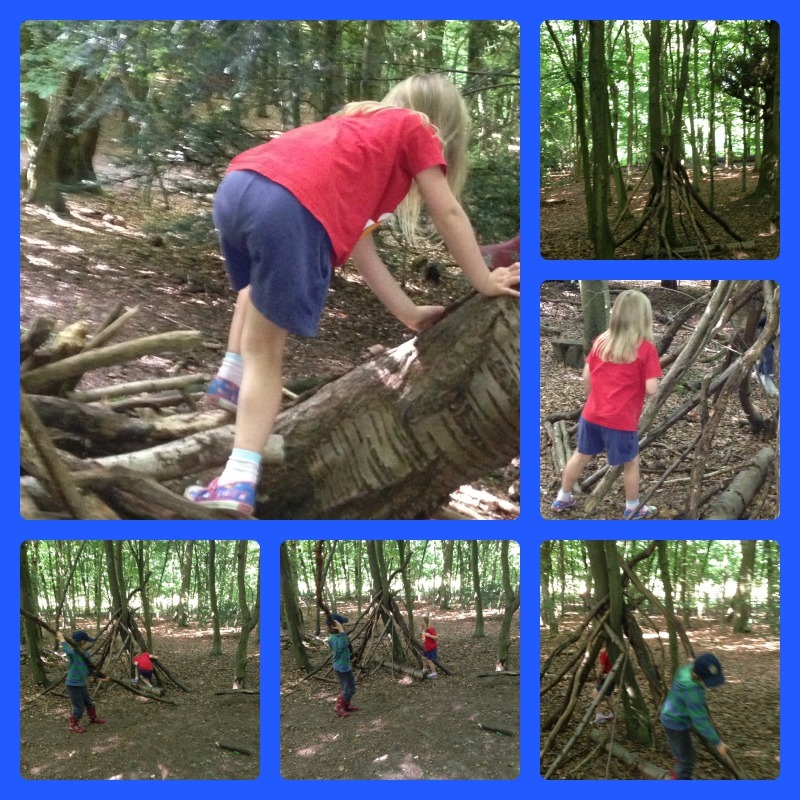 We hadn’t gone far when the children discovered two dens which had been partly built and started to add to them. 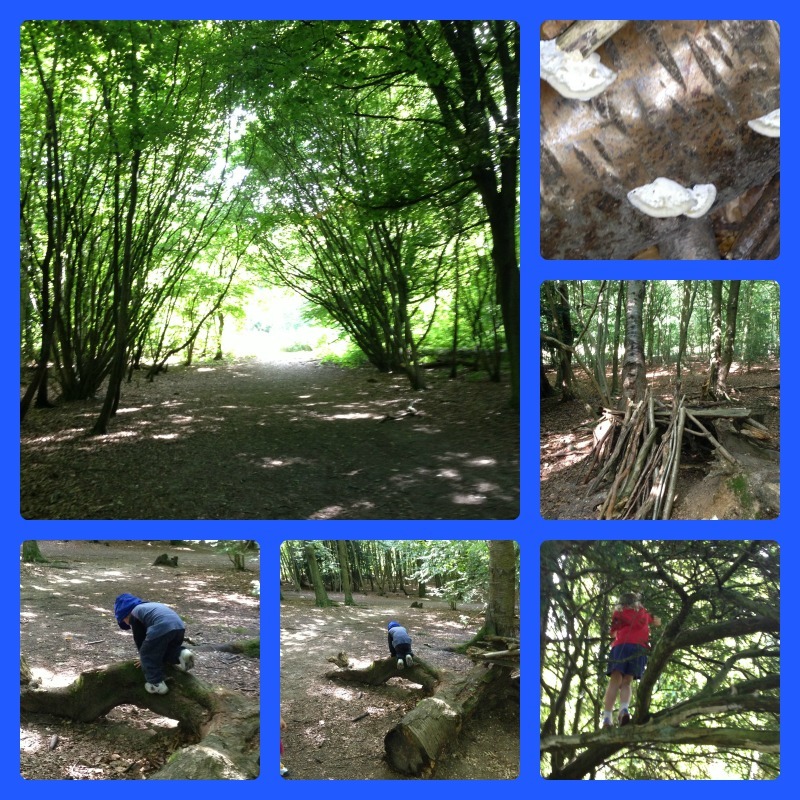 Monkey and Rabbit were especially keen on this and carried on for some time while the others were exploring the woods and collecting bugs. 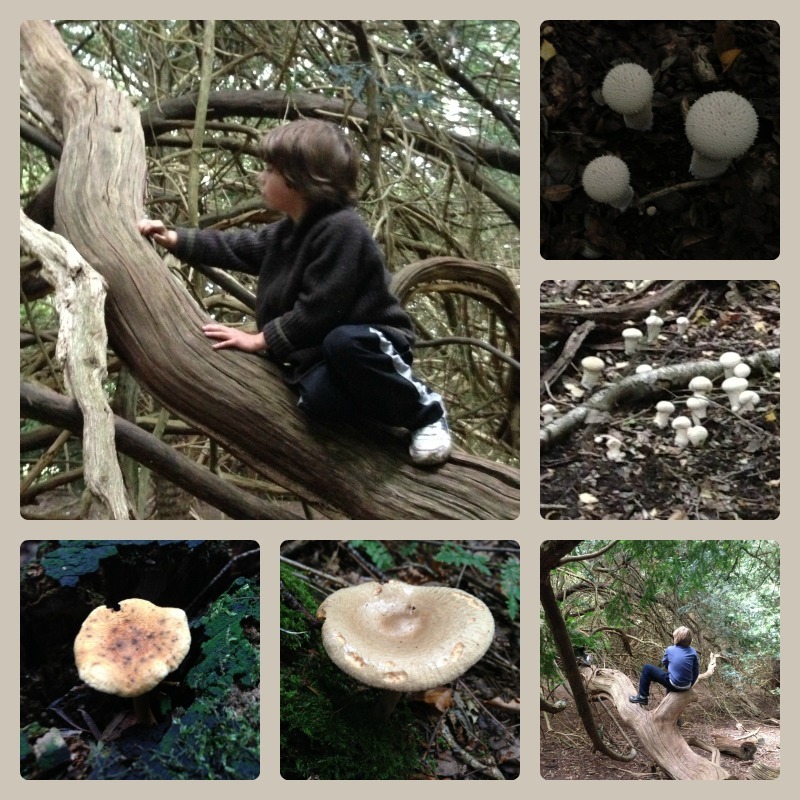 We also spotted some interesting fungi. After a while we moved on a little further, to a tree which the children love to climb because someone has helpfully built a platform with a den underneath. This kept them busy for so long that, after a quick snack, it was time to leave. It made for a rather short walk but they had a great time playing with their friends. I think we will have to find some creative ways to get them wanting to explore further next time, or we will never get past the tree house again! 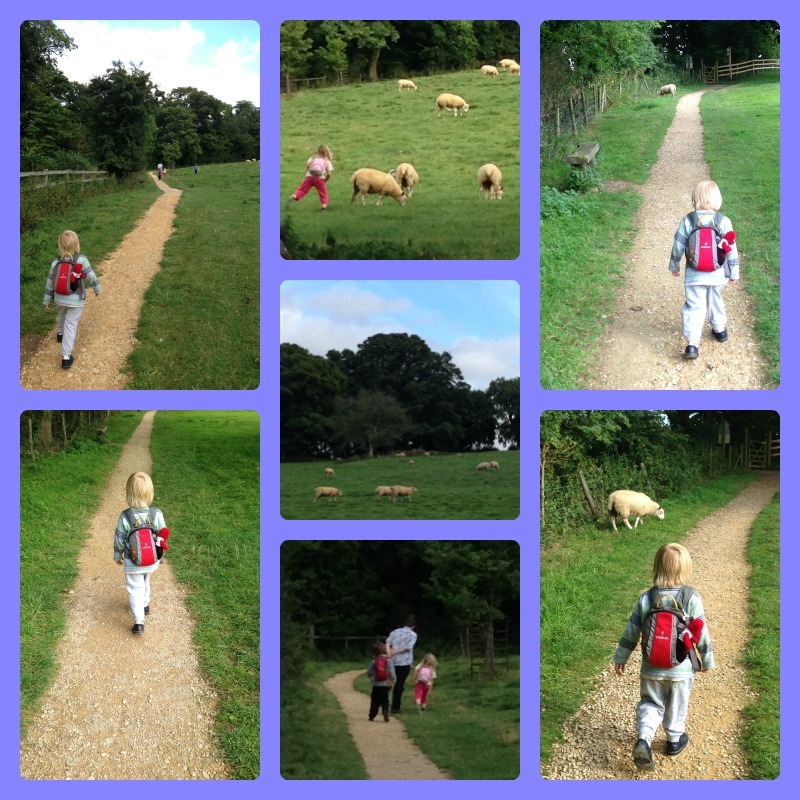 This entry was posted in Outings and tagged country kids, woods on August 23, 2013 by Hannah. 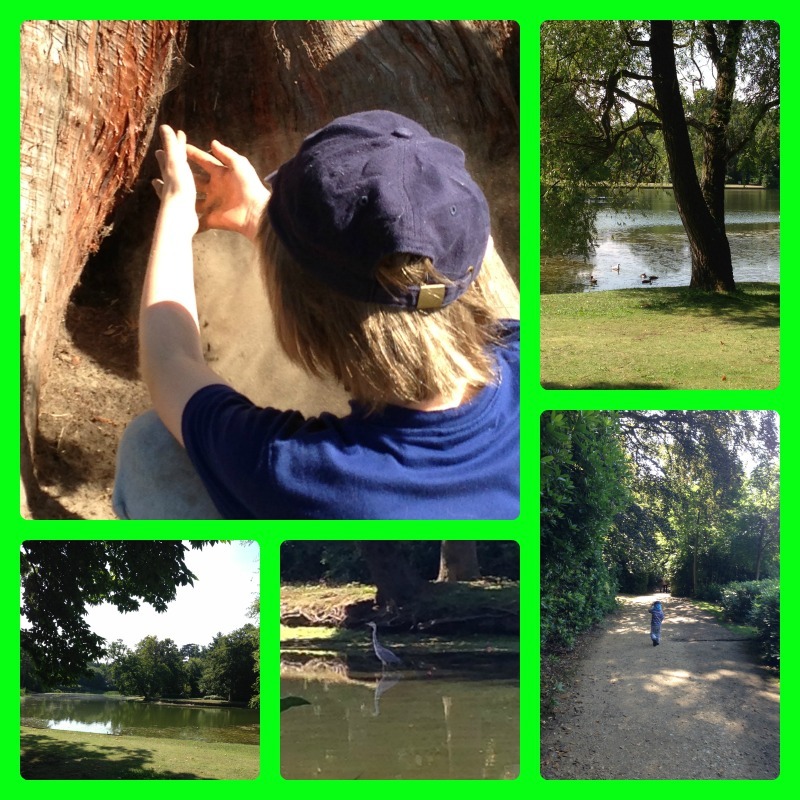 We are lucky to have some brilliant places to visit within walking distance from our house. Two weeks ago, when daddy’s cousin and her son were staying with us for a few days, we had a lovely afternoon out in our local area. 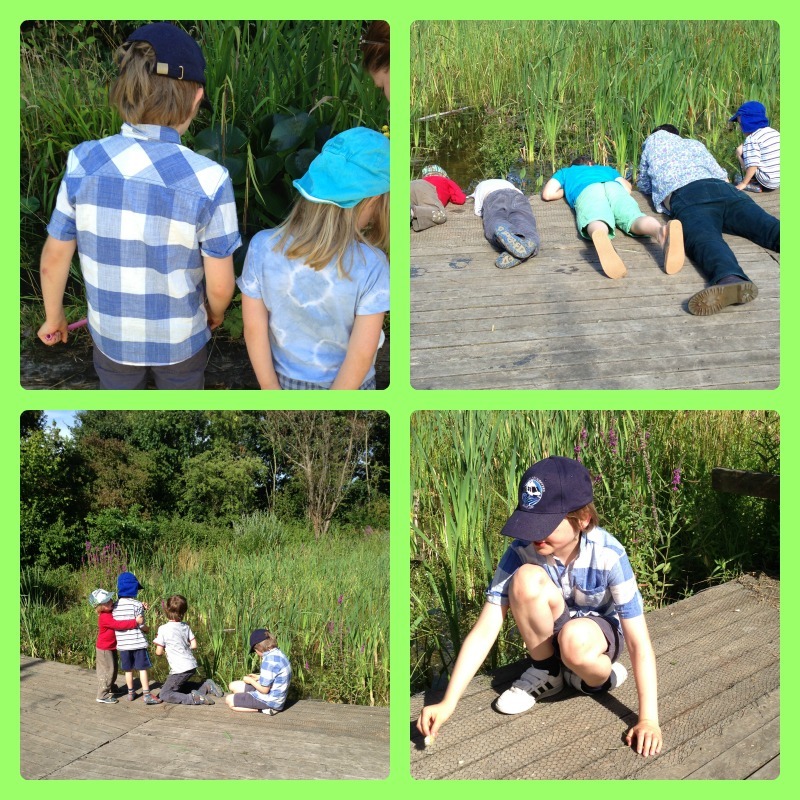 We walked to the Ecology Centre first, where the children did some pond dipping. They really enjoyed spending time with their big cousin, and also with our friends from Three Kids and a Gluestick who were there too. There was a lot of leaning over into the water, but this time Tiddler managed not to fall in! 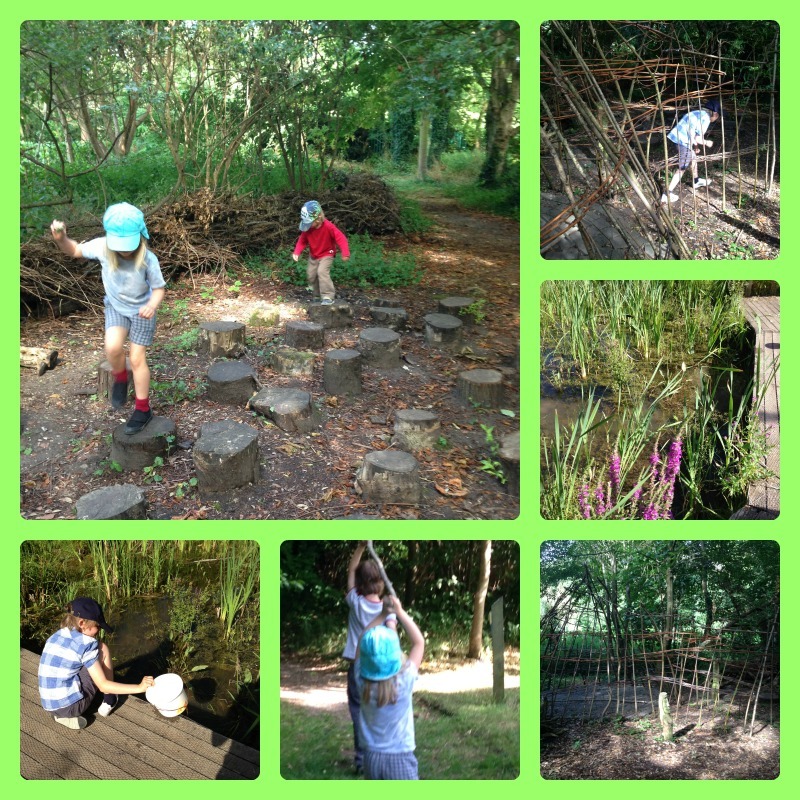 When we had finished pond dipping we explored the grounds some more and found some big stepping stones and a den. 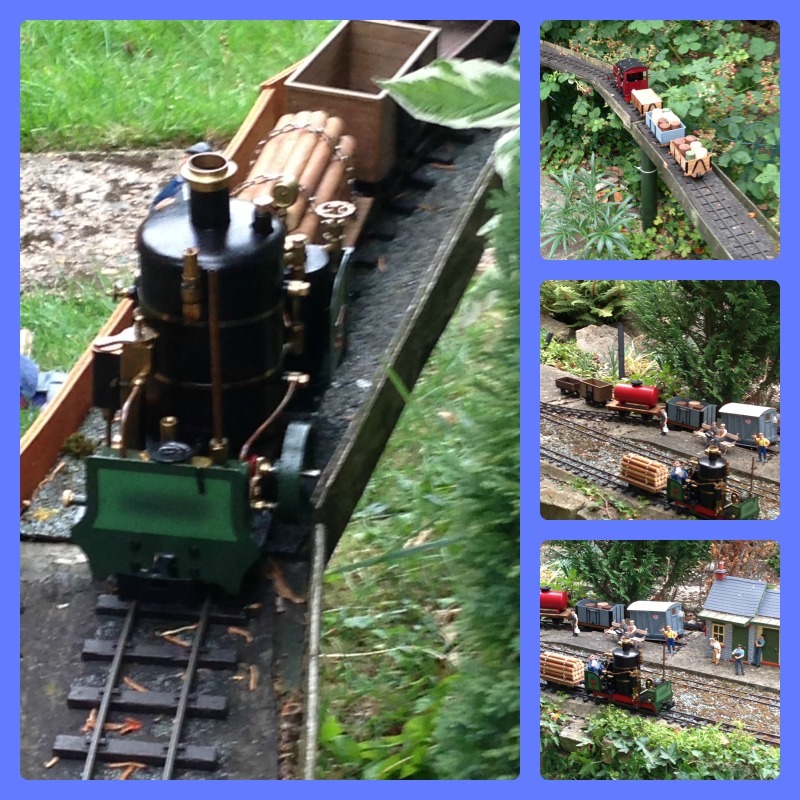 We then moved on to the small museum next door, where all the children started by playing with the trains. Some of them explored the museum further, but Owl and Tiddler were having such a good time at the train table that they didn’t move until it was time to go. The museum looks out over the ponds and it is very peaceful and relaxing. At the end of the afternoon we went to the park. 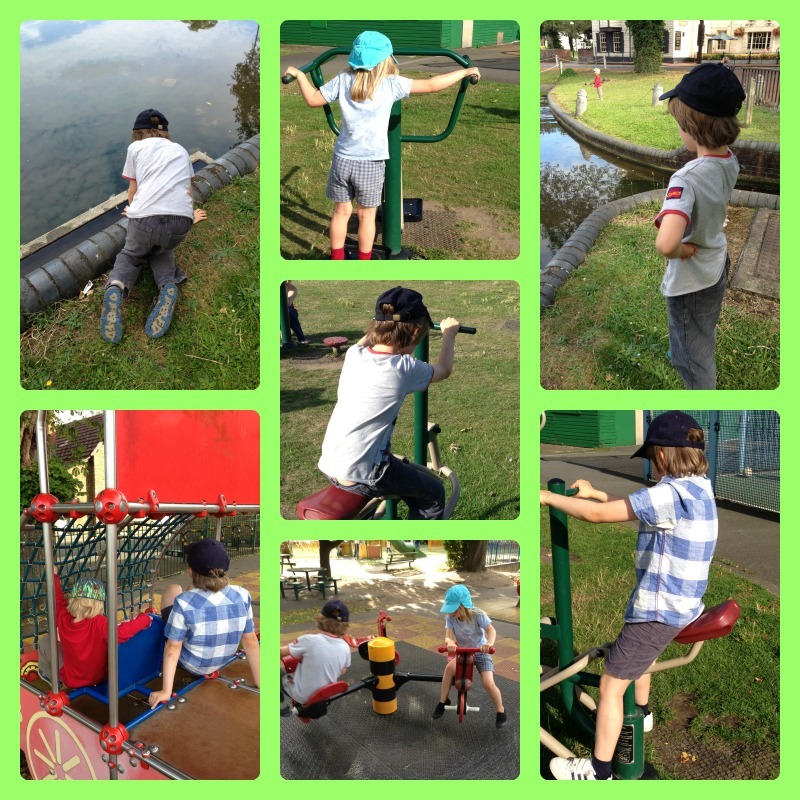 The children had fun testing out the outdoor gym equipment, before finishing with a quick play in the playground. It was a lovely afternoon and looking back on it now makes me realise how lucky we are with our friends, our family and the area where we live. 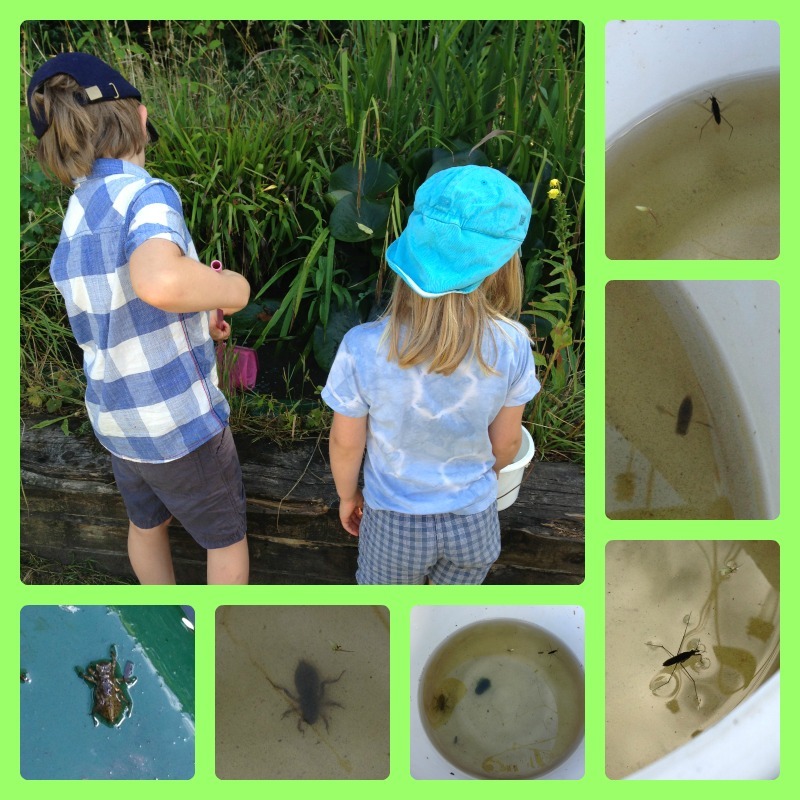 This entry was posted in Outings and tagged ecology centre, local museum, playground, pond dipping on August 18, 2013 by Hannah. On Tuesday it was daddy’s birthday and he had the day off work. 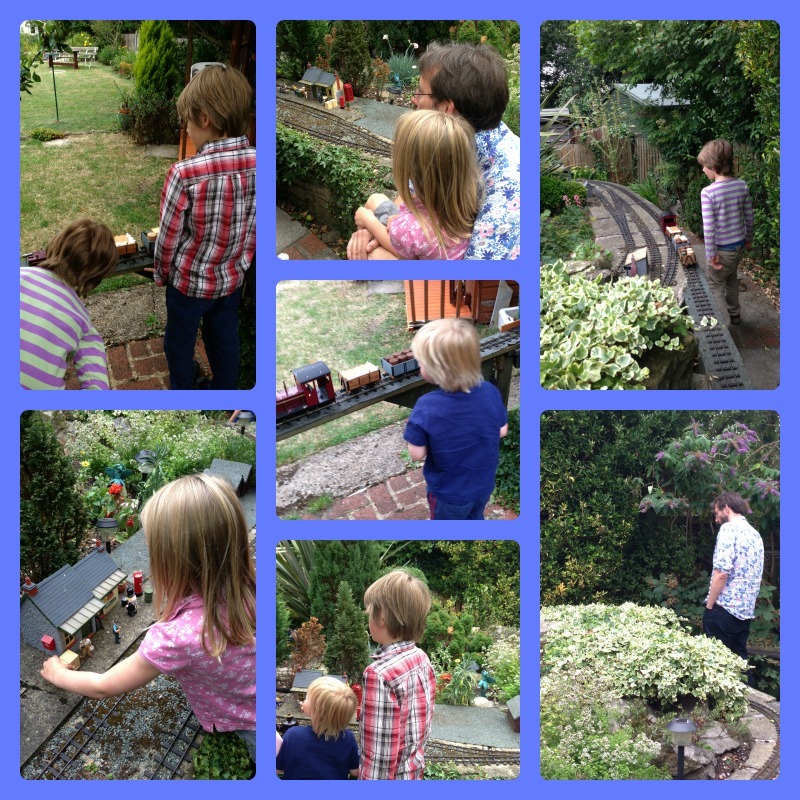 We had a lovely day together, and the highlight was an afternoon visit to some friends from our church who have a model railway layout in their garden. The children had a wonderful time. They operated the engines and watched the trains go round, and Owl talked non-stop to our friend who patiently answered all his questions and remarked what an intelligent boy he was! Daddy and I spent some time discussing the possible model railway layouts we could have in our garden if we ever have the time and money to do it! 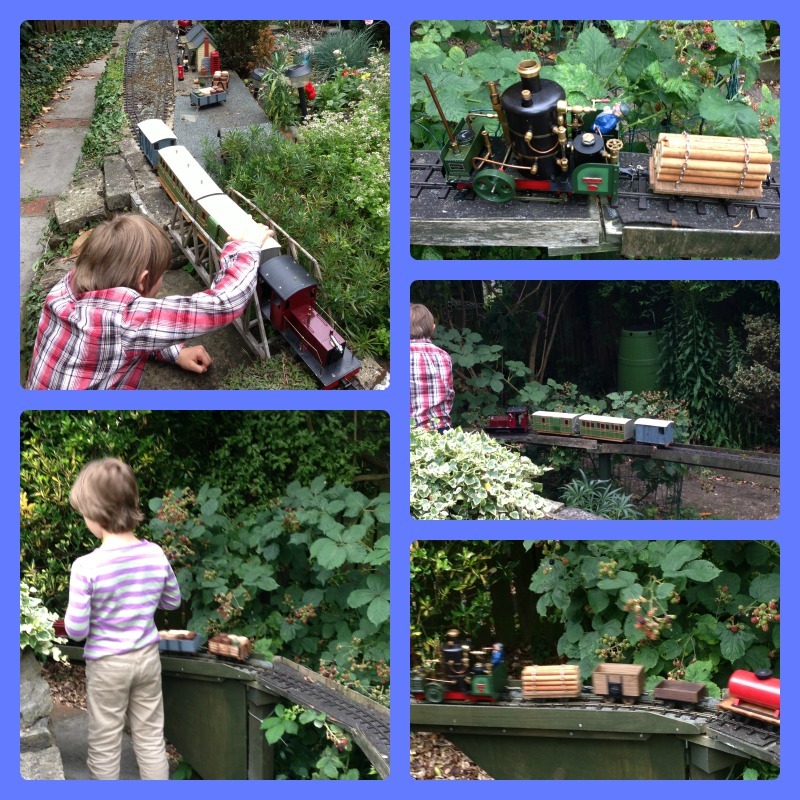 This entry was posted in Outings and tagged model railway on August 15, 2013 by Hannah.